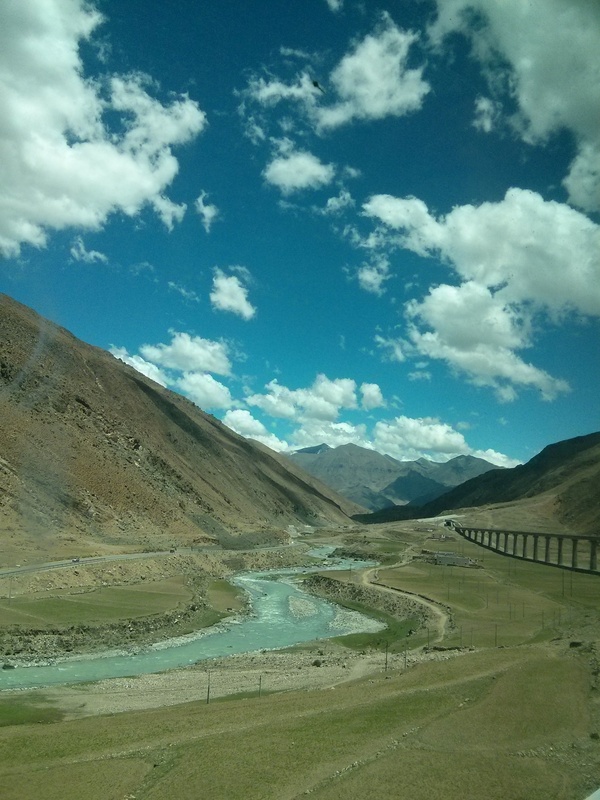 Our foray into Tibet started with a 24 hour train journey from Xining to Lhasa. 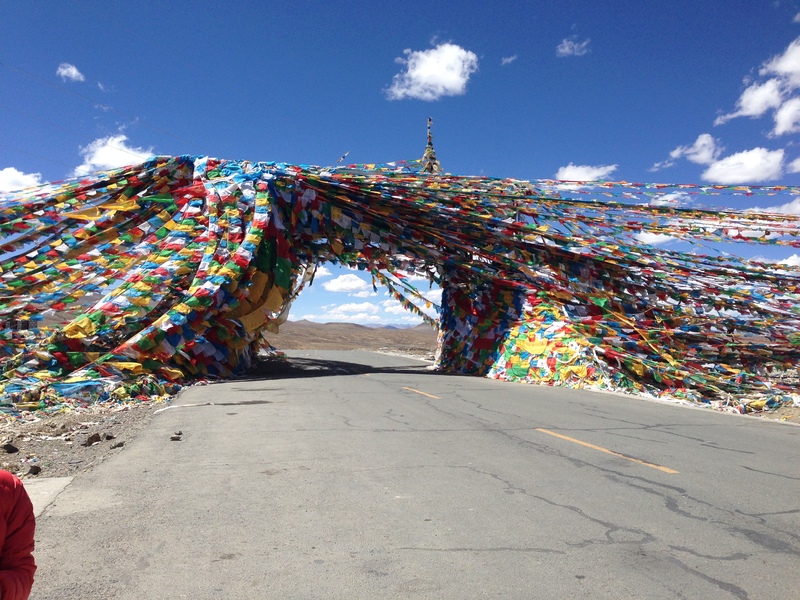 This is the world’s highest railway, the “Qinghai-Tibet Railway” with some people calling it (falsely) the “rocket to the roof of the world”…this is by no means a rocket train. The train peaks at a whopping 5072 meters above sea level at the Tanggula Station, also known as Dangla, which is unsurprisingly the world`s highest railway station. The oxygen here is half of that which is available at sea level and as such oxygen is pumped into the cabins of the trains from the 3500 meter mark. This would ordinarily be a good thing but alas this is offset by hoards of Chinese men standing in the enclosed trains smoking cigarettes next to the no smoking signs. As a former smoker for many years I am fast becoming an anti-smoker due to the manner in which the Chinese blatantly disregard all semblance of consideration. 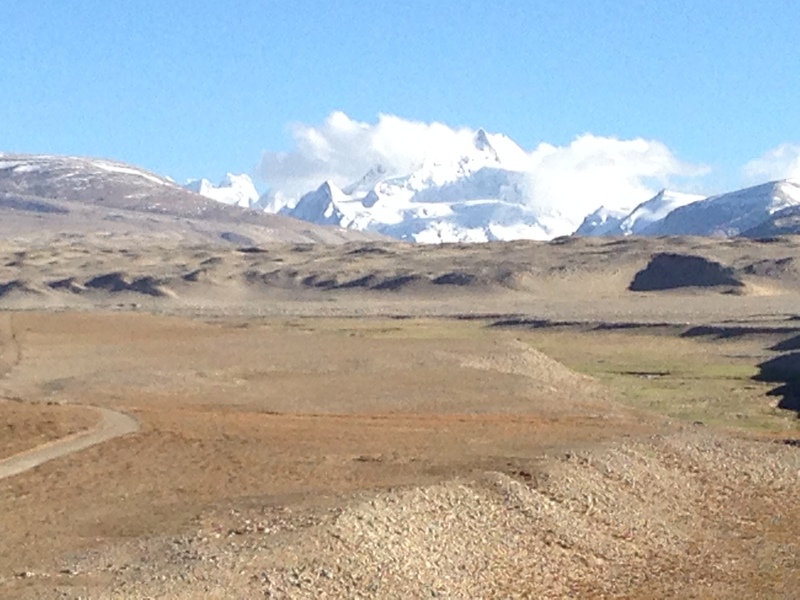 The scenery along the journey is spectacular…with wide sprawling plains criss-crossed by streams and dotted with sheep (the non fat bottomed kind) and yaks…all leading to snowy peaks. When the sun rises in the morning you find yourself in a 100% whiteout as the clouds and snow envelop the train. 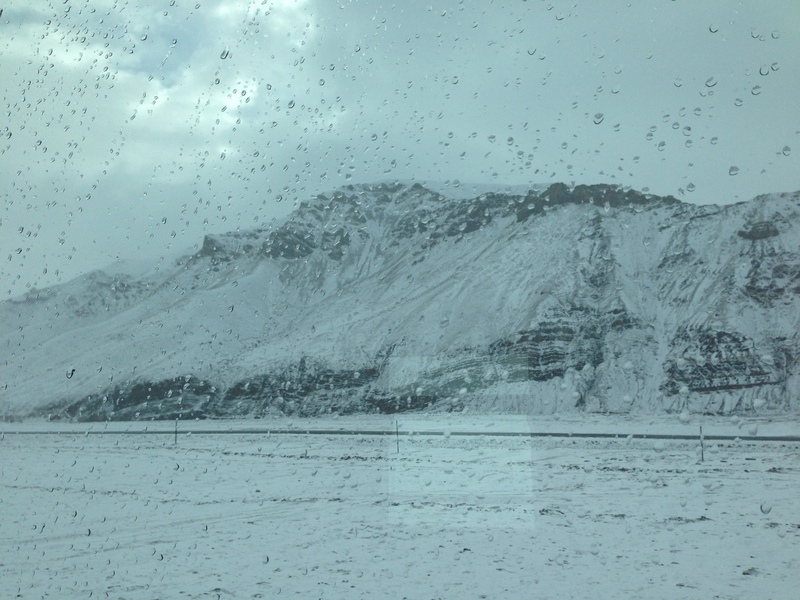 As the train climbs to its highest point the clouds give way to the icicles that slide down your windows and the majesty of the mountains. 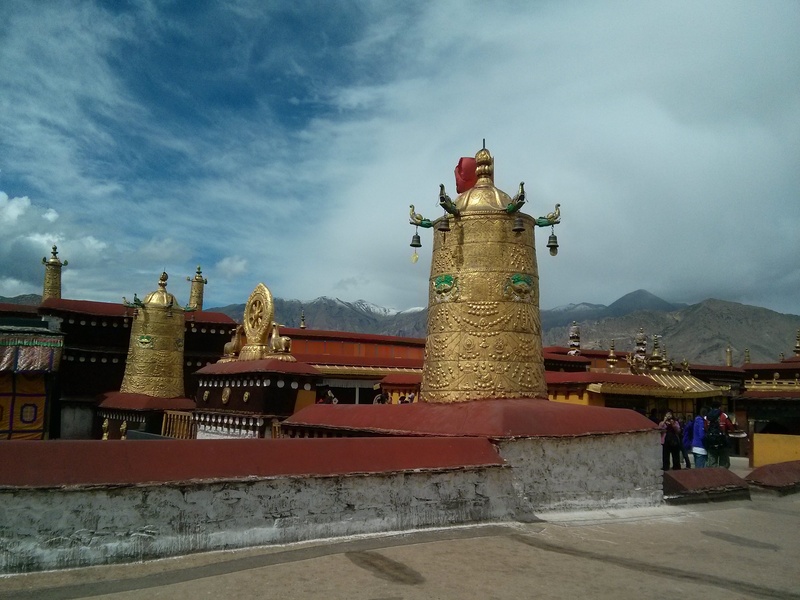 The trip to Tibet is very heavily controlled and cannot be done on an individual basis but rather must be done as part of an organised tour. This obviously adds to the expense and places you fairly in the midst of touristville with no options for escape. 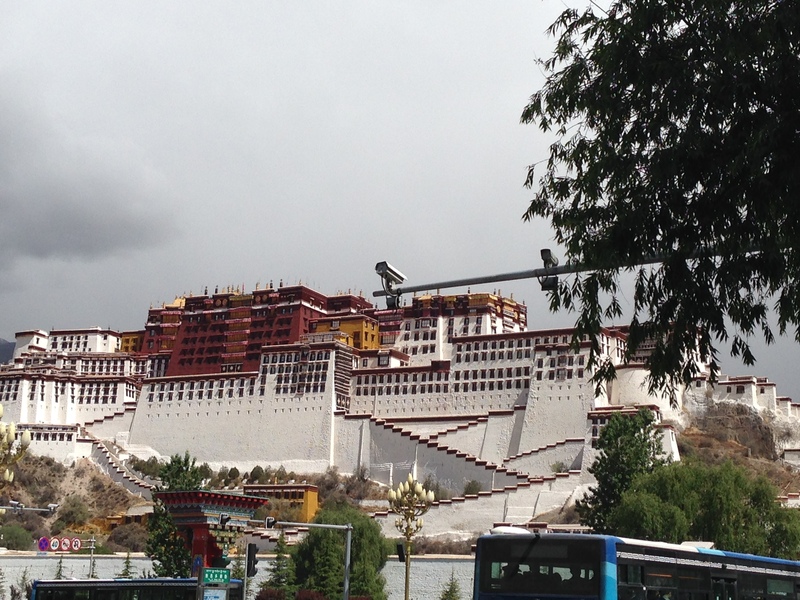 The first real stop on the tour was the Potala Palace which is the traditional home of the Dalai Lama and has been since the 17th century. 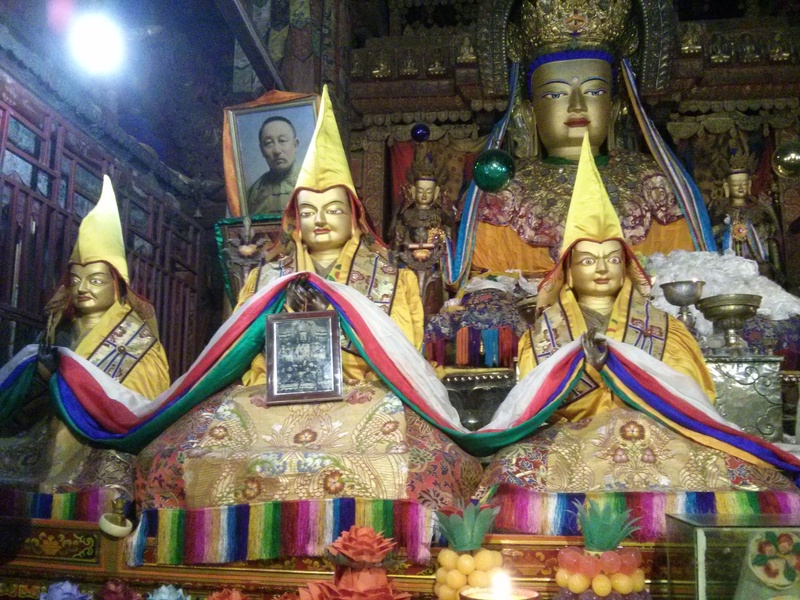 In 1959 the current Dalai Lama fled to India during the Tibetan uprising. 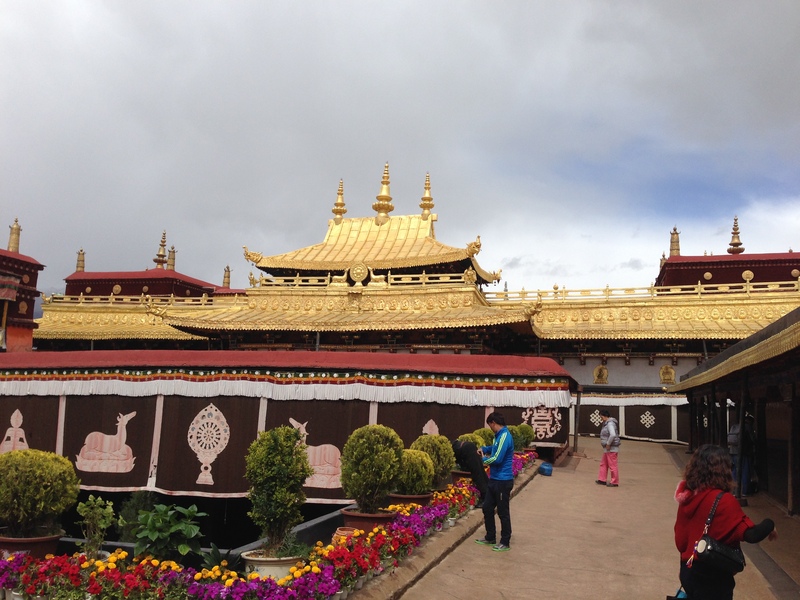 The palace is built at an altitude of 3,700 m (12,100 ft) and houses the mummified bodies of the previous Dalai Lamas (5-13). 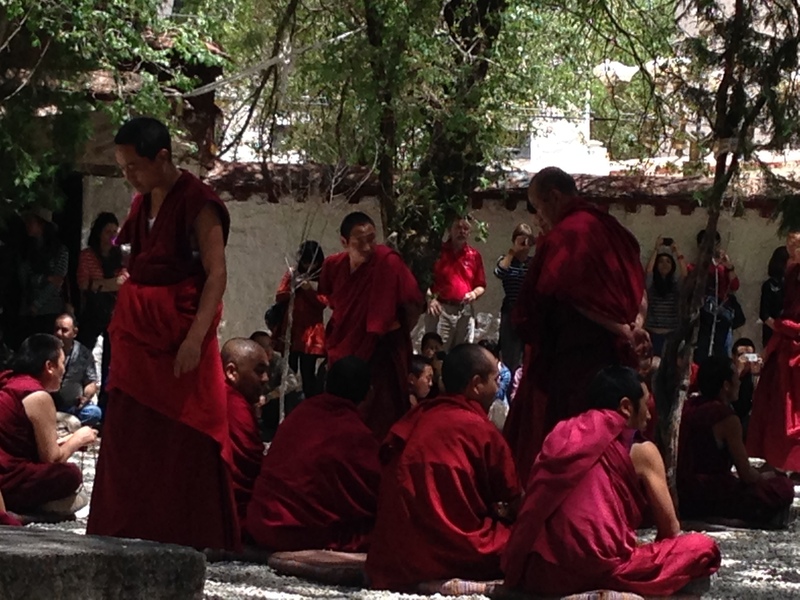 According to our guide the monks go in to cut the hair and fingernails on the deceased Dalai Lamas every so often. 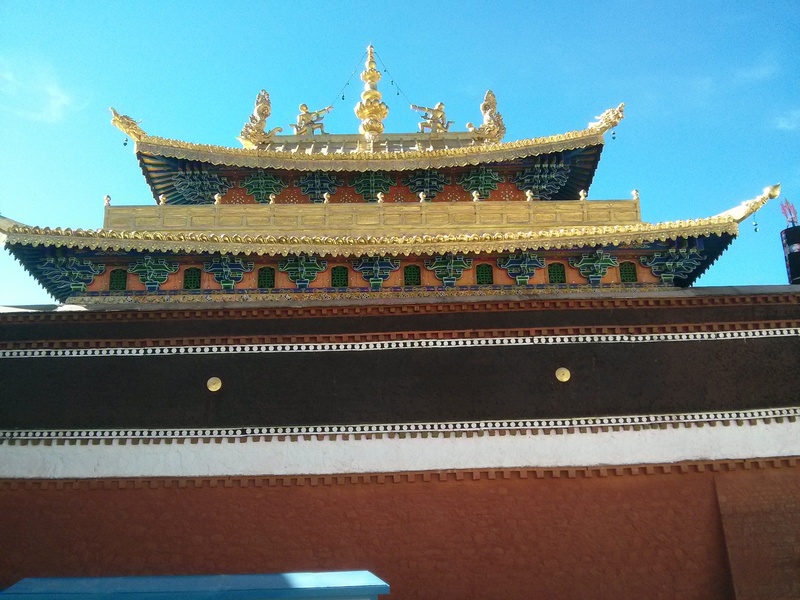 Following the Potala Palace we headed to the centre of town to the Jokhang Temple which is the oldest (7th century) and most important temple in Lhasa. 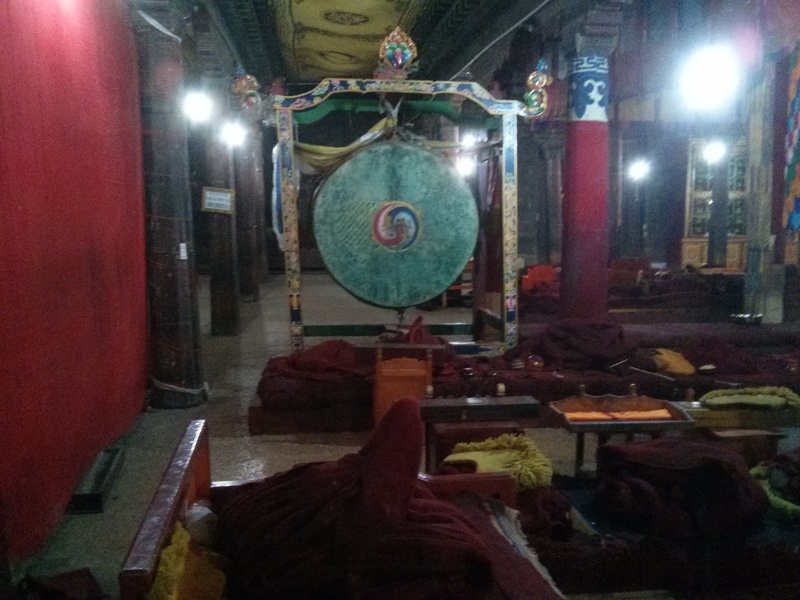 The temple is surrounded at all times of day by people performing a full body prostration kora around the temple. For the heathens amongst you (like me) they stand praying for forgiveness for the sins of the body, the mouth and the heart…and then lie face down on the stones…stand take three steps…and do it again. 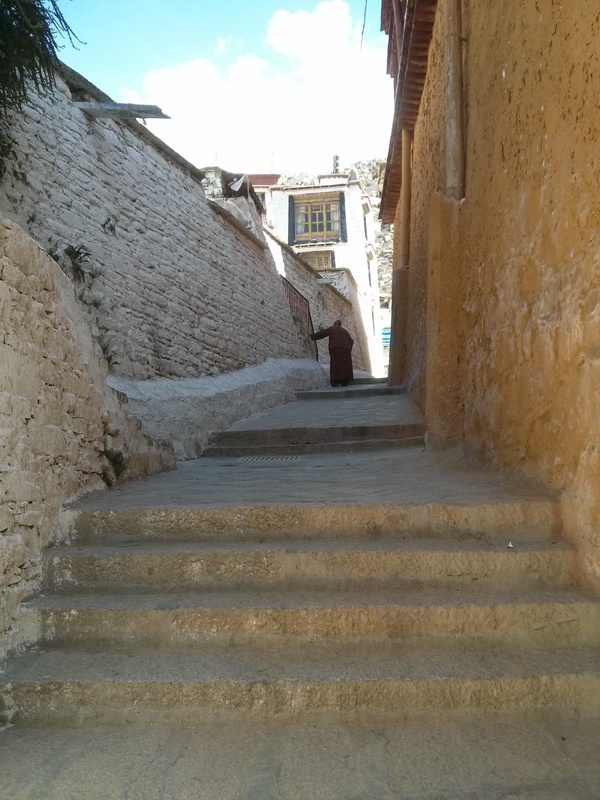 The guys in Lhasa did three laps of the temple (about a kilometre each lap) but according to the guide people are known to do this between religious sites totalling over 500 kilometres. Many of the ones we saw had callouses on their foreheads. 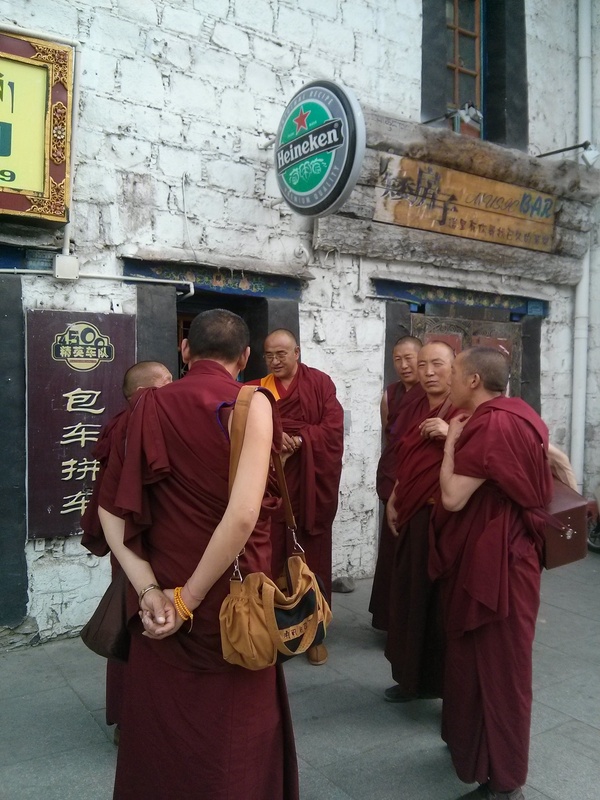 The next day we headed off en masse again to the Drepung and Sera Monasteries. 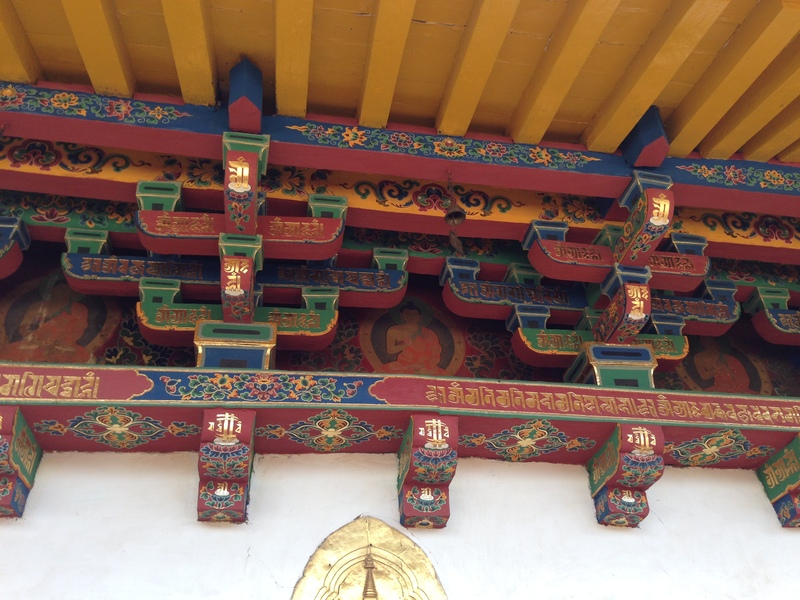 The Drepung monastery was the home of the Dalai Lamas prior to the construction of the Potala palace by the 5th Dalai Lama. 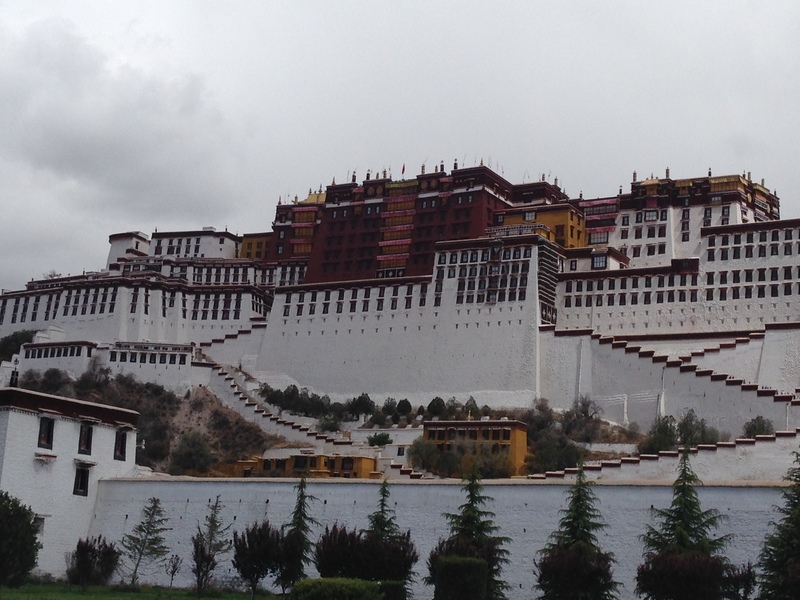 As such it holds the bodies of 2-4 with the first Dalai Lama really not getting a lot of kudos. These are beautiful sights on either end of the city. 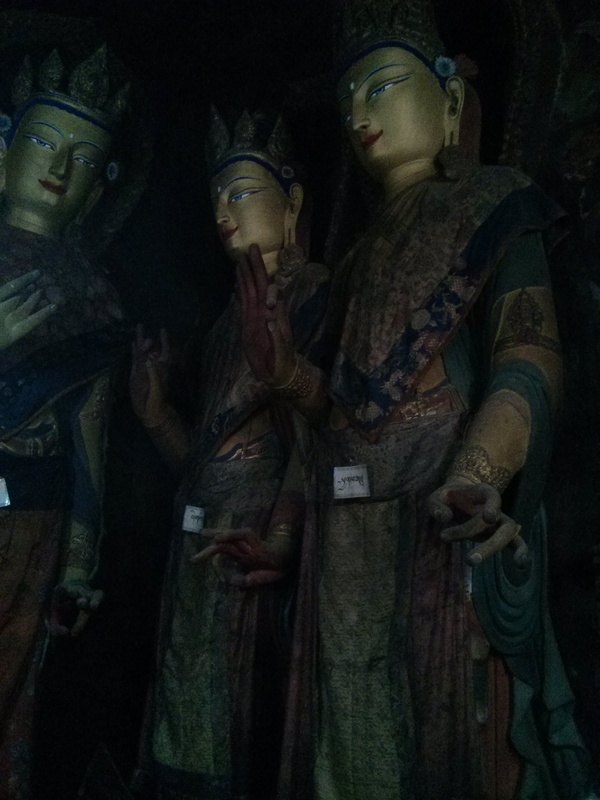 We had planned to head to the museum but were advised by the tour guide that there was no history there…just the Chinese story about the peaceful integration of Tibet. 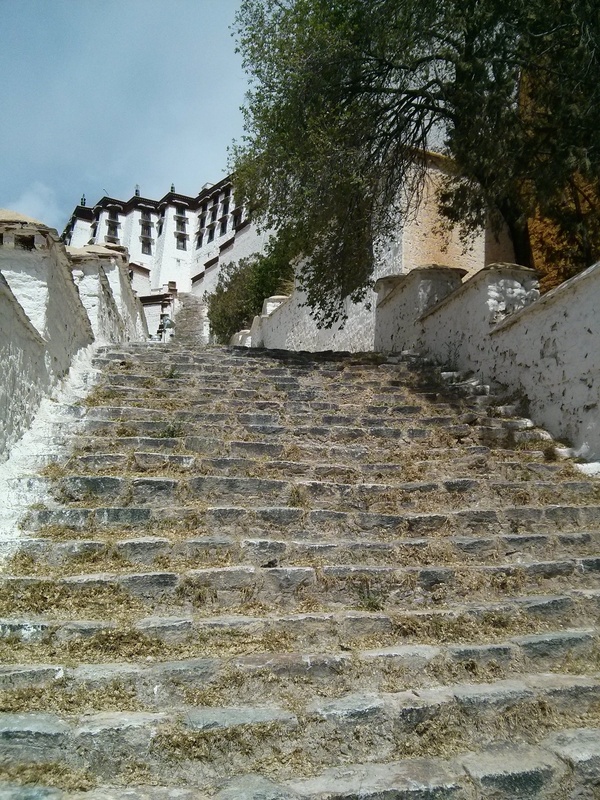 The monasteries at high altitude are proving to be a fair challenge. The scarcity of oxygen, combined with the stairs you climb to get to them means you are breathing very heavily when you get there. Alas upon arrival you are sucking in gobfulls of incense. 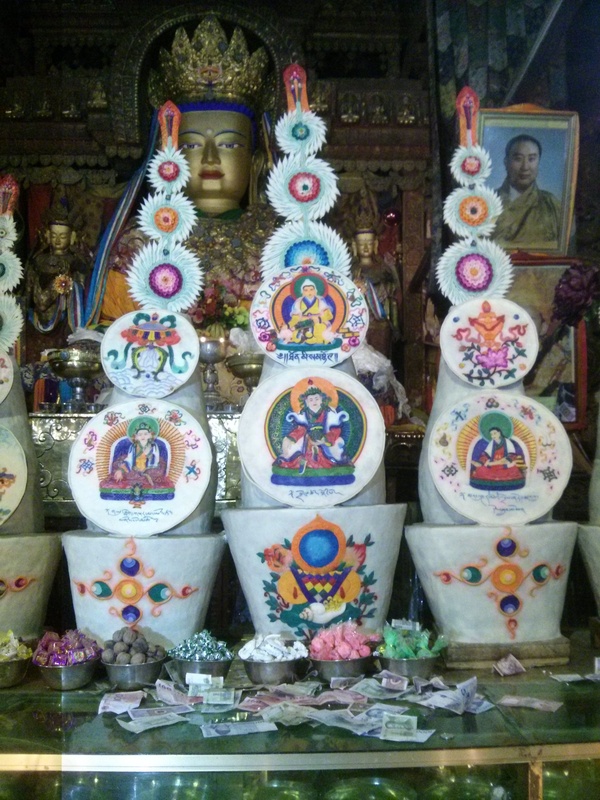 Add to this the fumes from the yak butter candles and there is some serious hyperventilating going on. 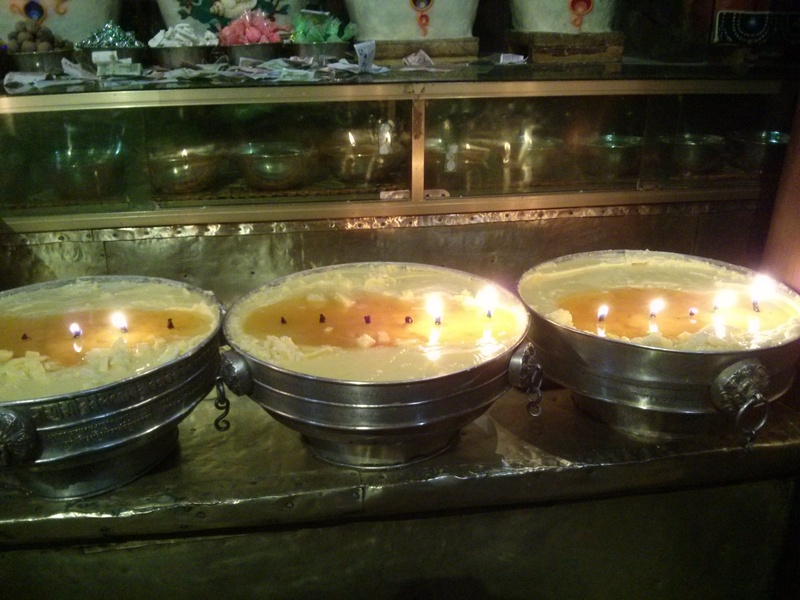 I swear that breathing in the fumes from the yak butter candles upped my cholesterol level by about 5 points. 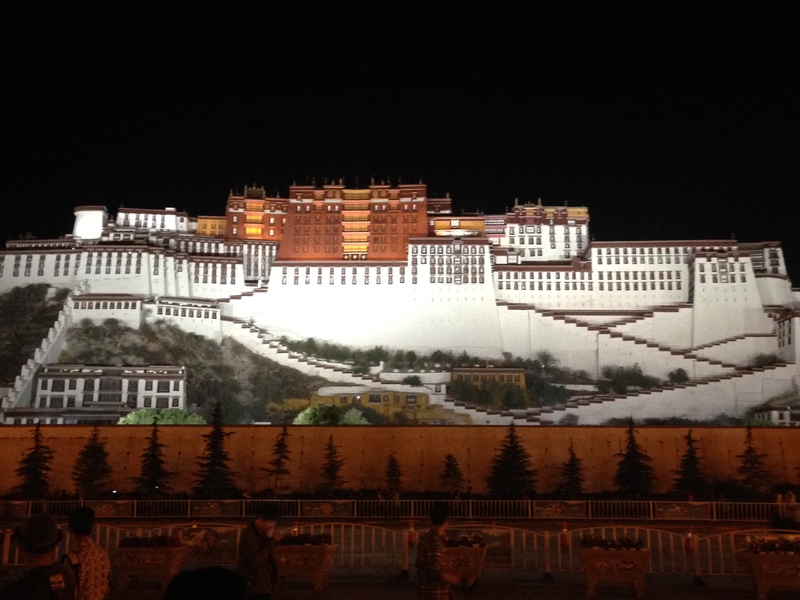 On an evening outing we floated past the Potala Palace on our way to the local night market and found that is was lit up in the evenings. 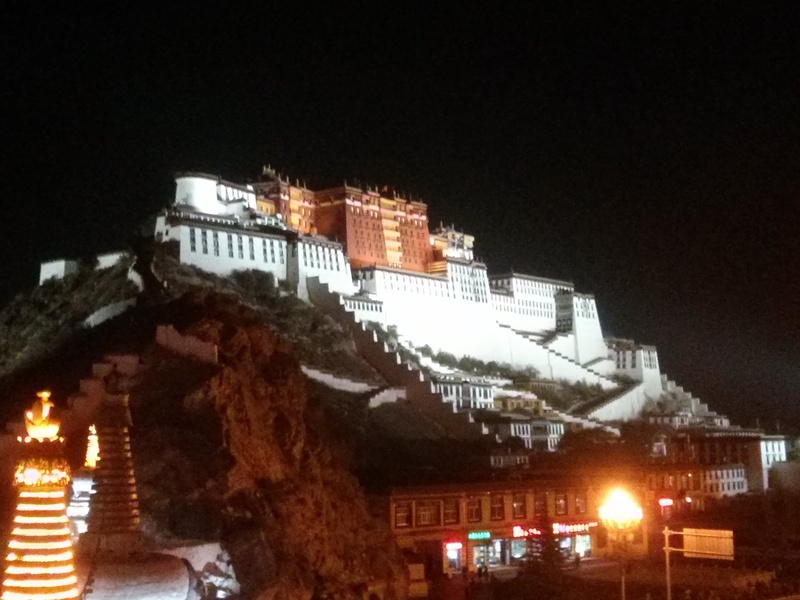 So on our return to Lhasa after hitting Mount Everest Base Camp we grabbed the group and headed to the palace for an evening photo shoot. 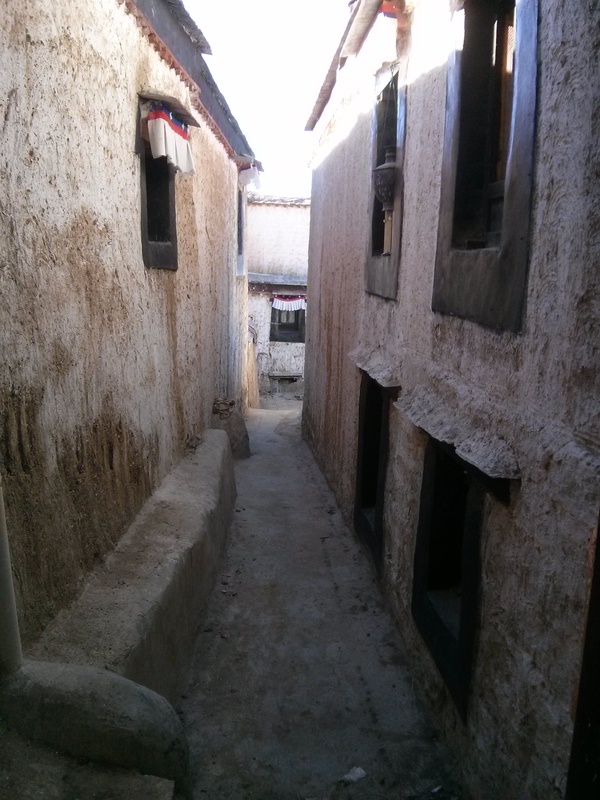 We headed off on the Sunday morning from Lhasa to Shigatse which was to be a slight increase in elevation but transiting through a serious elevation bump. 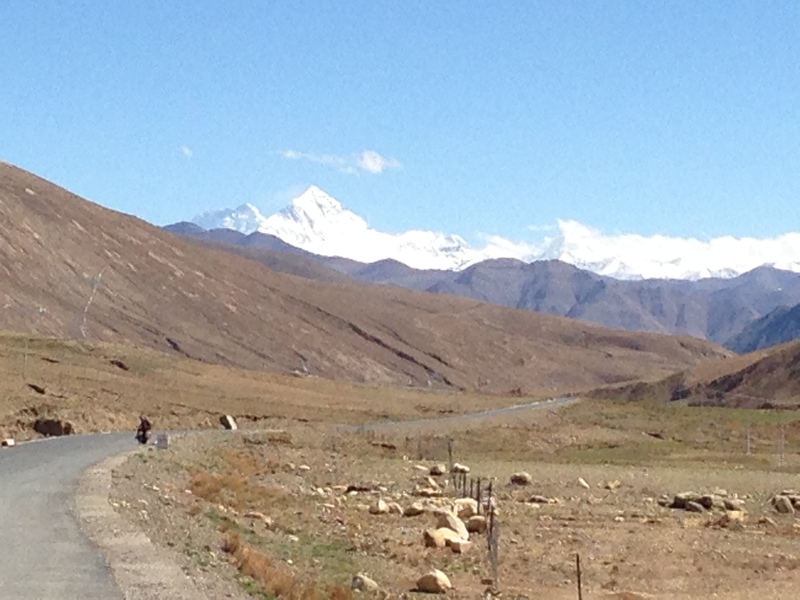 As it was a holiday weekend the Everest ticket office closed early so we took the long route to get there. 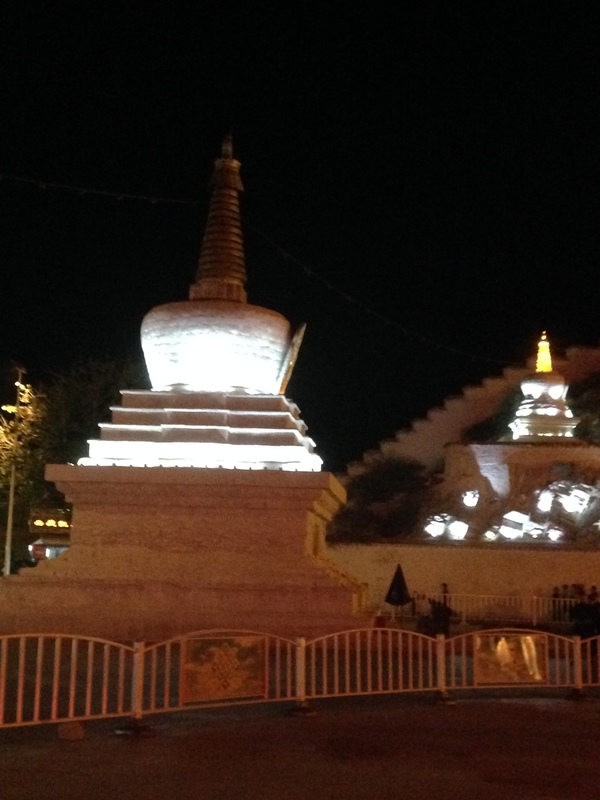 This saw us leaving at 9am and arriving in Shigatse at around 8 pm that night. The entire time was not spent driving but rather we stopped off at three of the most spectacular sights that we have seen thus far. 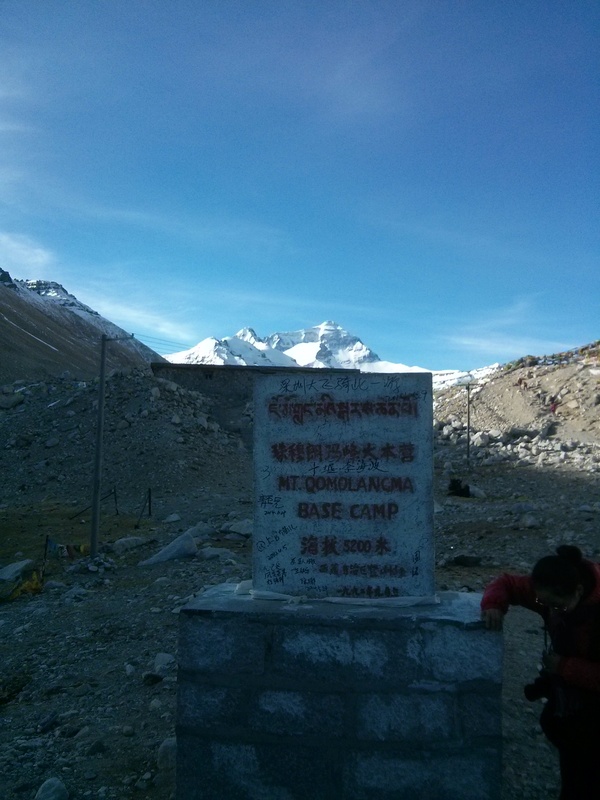 The first was the Khambala Pass at 4794 metres above sea level. 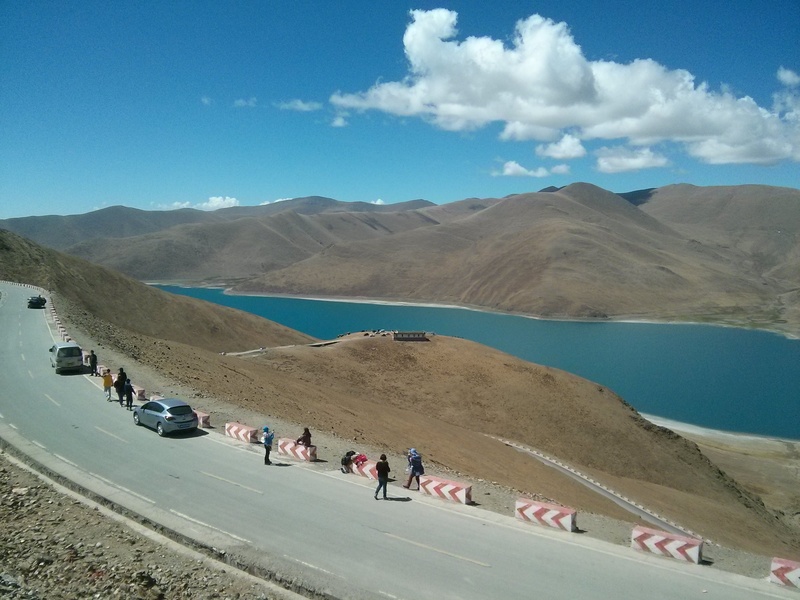 This was the passage to pass over the mountains and from the top you had a magnificent view down over the Yamdrok-Tso lake which is one of the three holy Buddhist lakes. 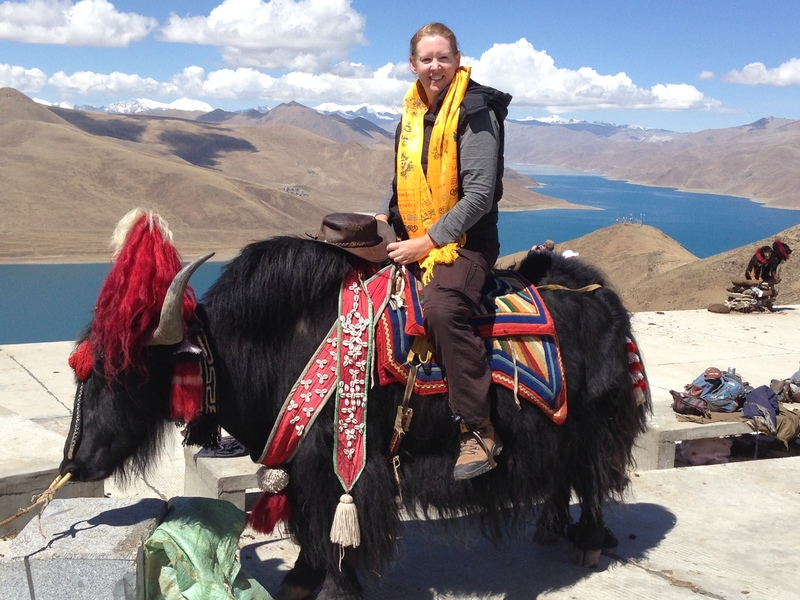 While perched high on the hill I managed to get Jill to ride and be photographed atop a yak. Heading down from the pass we stopped at Yamdrok lake for some more photos and the ever present trinket selling. 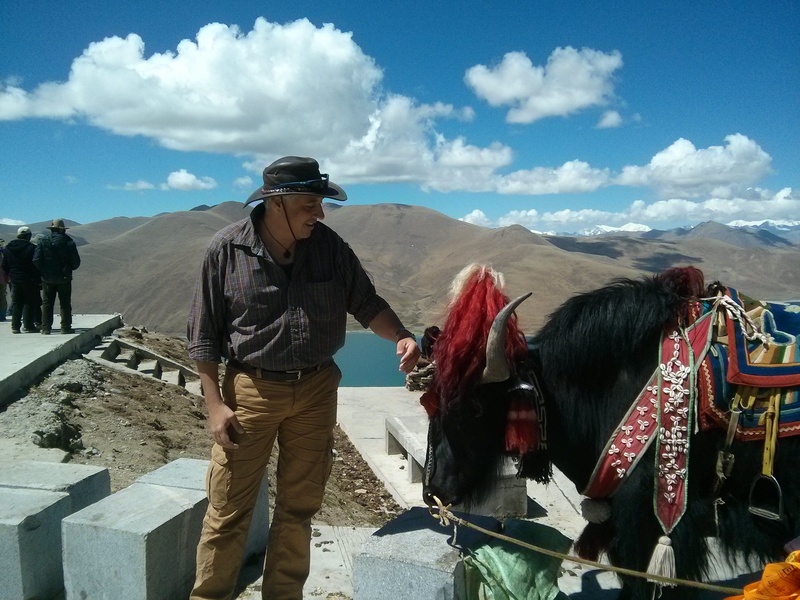 Alas having seen the placid yak atop the hill I tried to pat the one at the bottom of the hill…while he was eating…bad mistake. 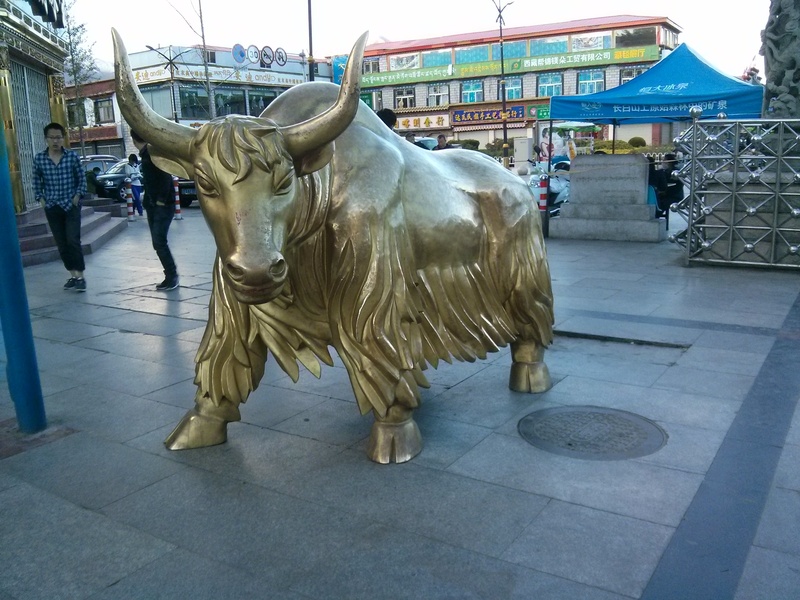 Tip for young players if an animal is eating…leave them alone…especially if they weigh about as much as a car and have big horns. Anyway…after a minor goring and some serious threatening gestures later…I learnt a lesson. 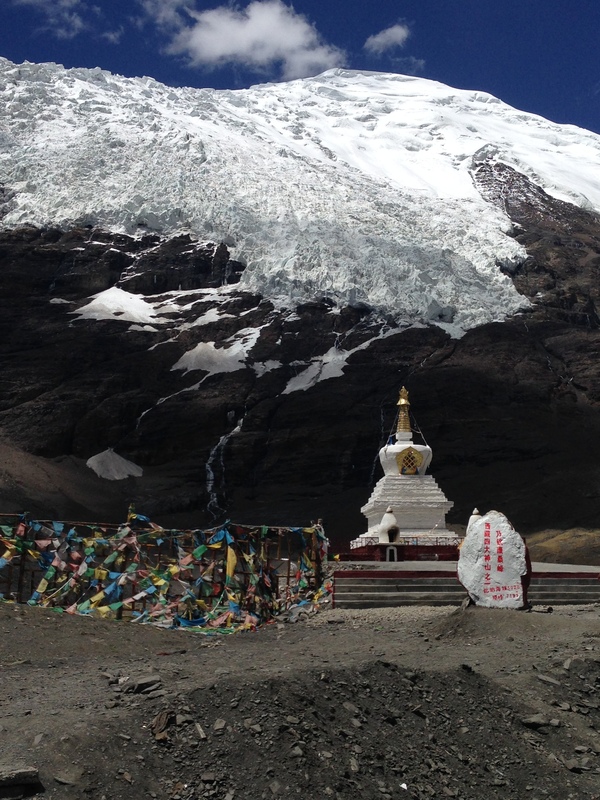 A bit later on we made a stop at the Karola Glacier which was happily at 5020 metres at its base where we were but was 7191 at its peak. 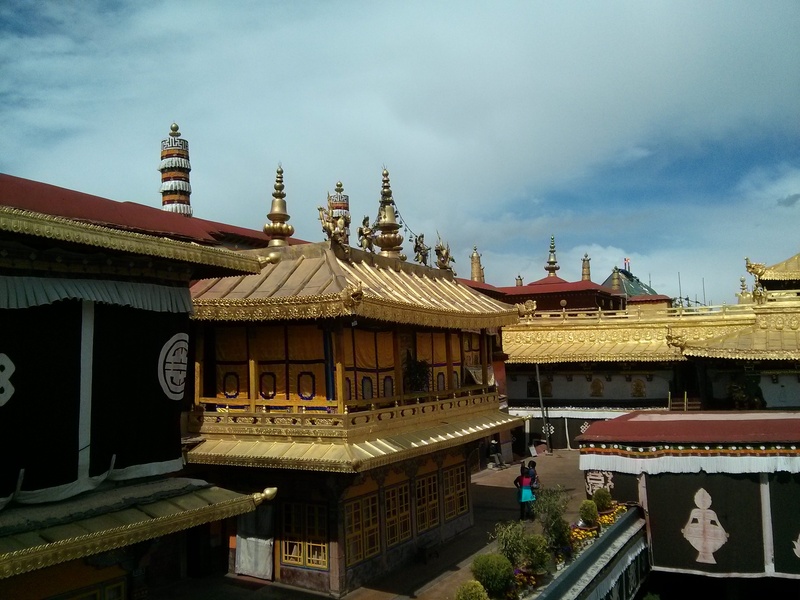 A few photos and some more locals pestering us to “looky looky… Cheap cheap” at the now ubiquitous trinket shops and we were off again. 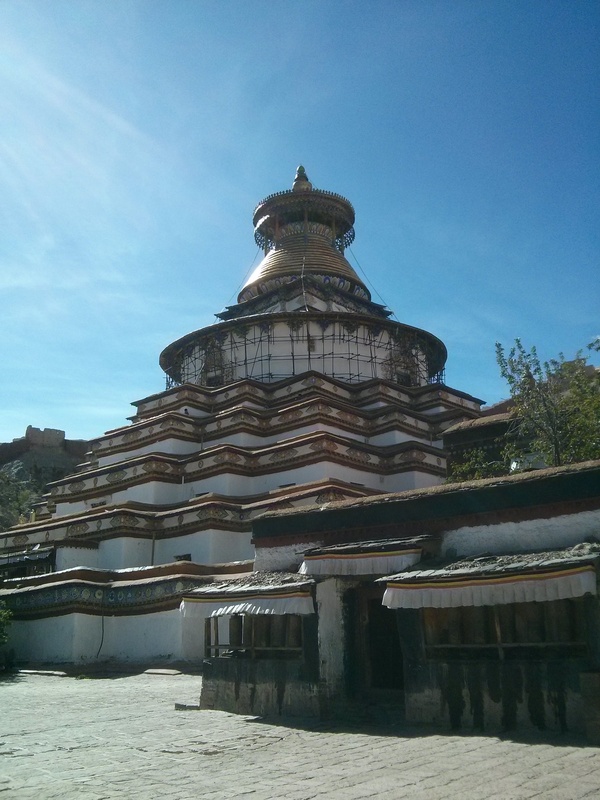 After this we went to the Pekor Chode Monastery which was built in 1914 and was the first monastery that allowed photographs inside (for a small fee). 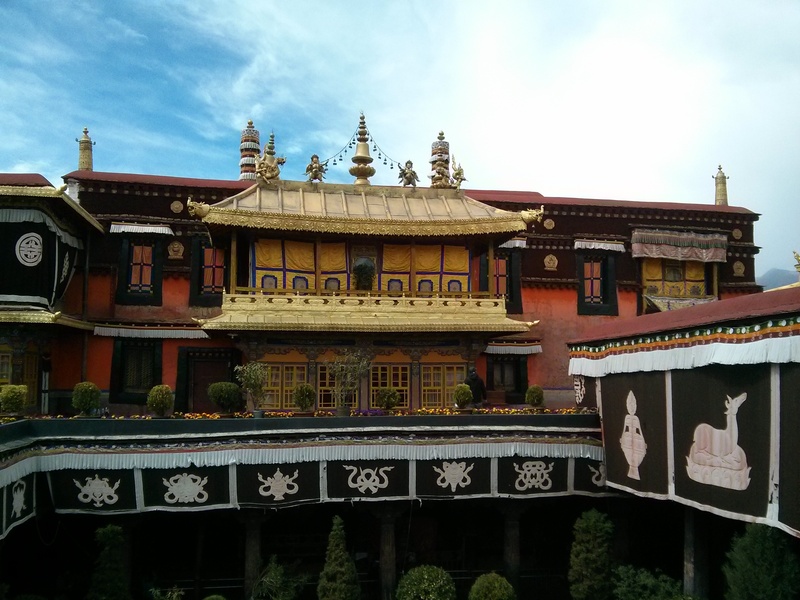 One monastery is very similar to the next and the key images, layout and structure are all pretty much the same. This one was one of the few that allowed photos or at least did not charge extortionate rates to allow any images within. 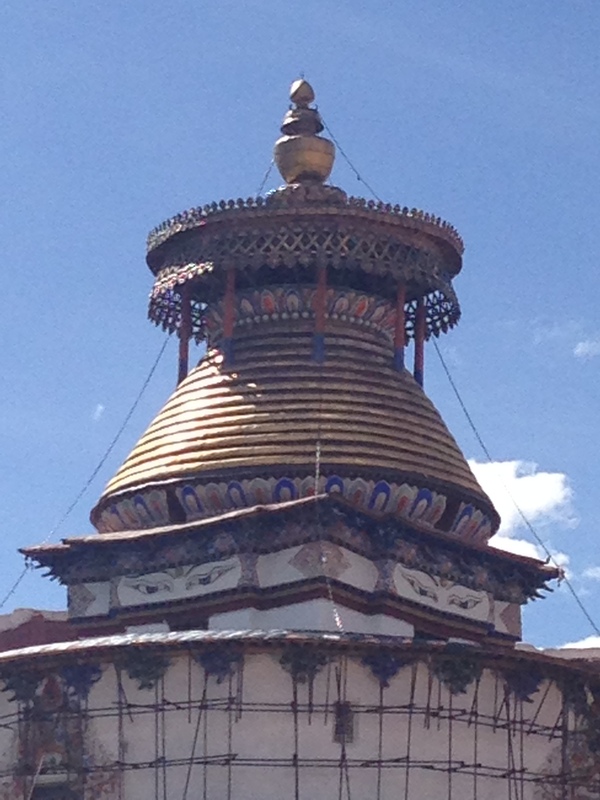 All of the monasteries have been stunning although due to the burning of incense and yak butter candles I have had shortened adventures prior to choking on the fumes. We paid the fee and Jill went crazy. 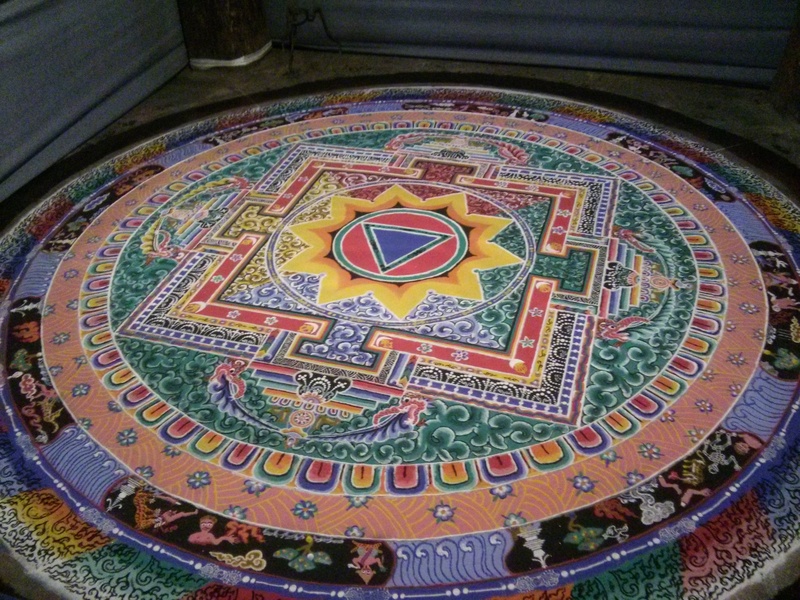 The standout feature to this place was the sand paintings. 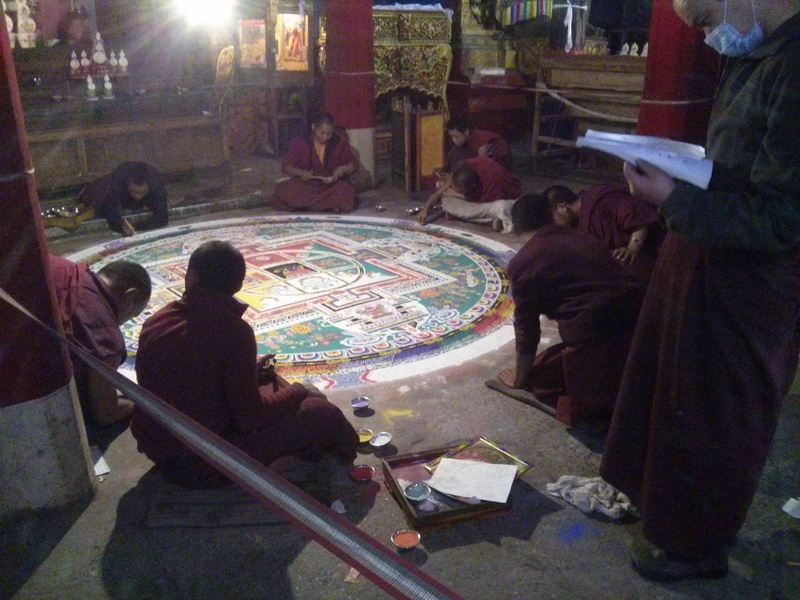 The monks sat in a circle on the floor and poured coloured sand onto the ground. 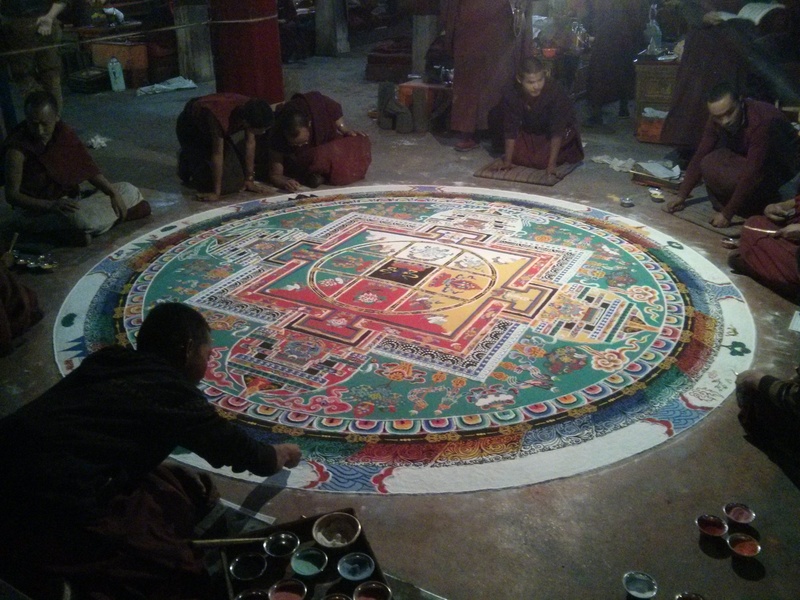 Not that impressive you may think…but they did it in an artsy way…a seriously impressive 2.5-4 metre diameter intricate as all get out kinda artsy way. 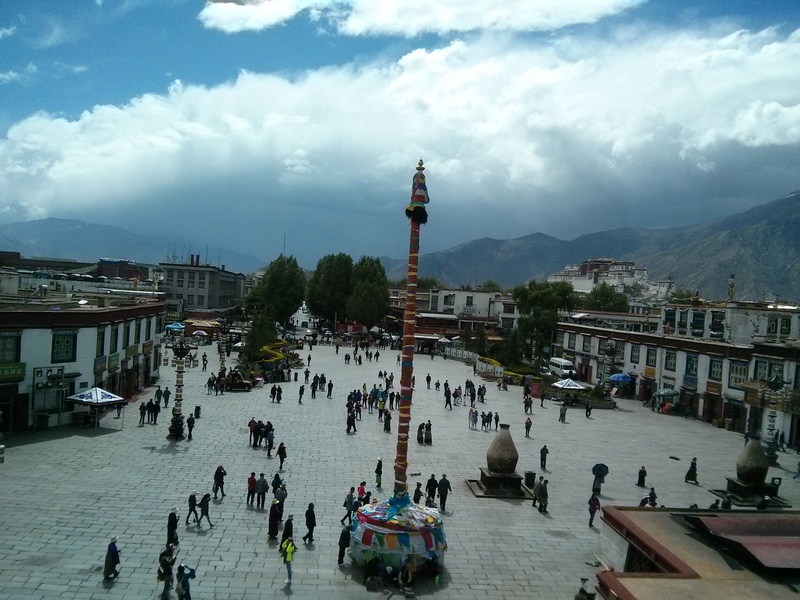 We got into Shigatse, had a meal and crashed. Well sort of…I spent about 90 minutes hyperventilating as I could not get breath into my lungs. At 12:30 am I went to reception in an attempt to purchase oxygen…as I stepped into the hallway I nearly fell over as it was choked with cigarette smoke and incense. 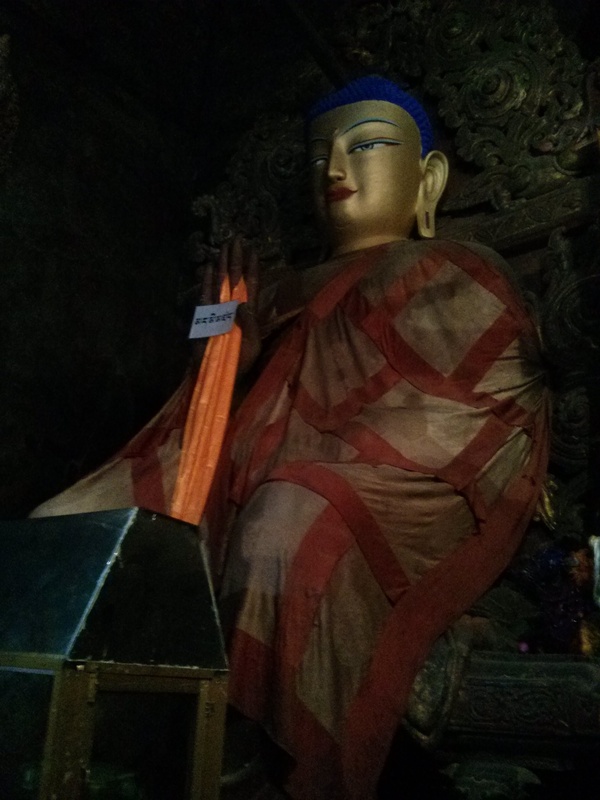 As a long term former smoker I am not opposed to smoking but when you are at altitude and every bit of oxygen is precious…copping gobfulls of smoke and the incense they use to try and mask it is debilitating. No oxygen in reception but a short time later the drunks went home and the incense stopped burning and I could breathe again. 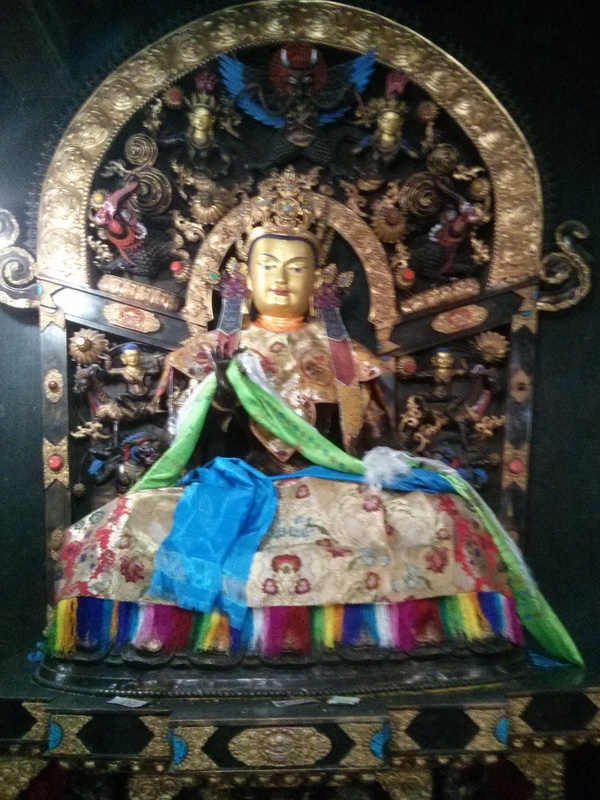 The next morning saw us visiting the Tashilump Monastery in Shigatse while the guide got us our Everest passes then we did the big drive to Mount Everest…or Qomolangma in the local lingo. 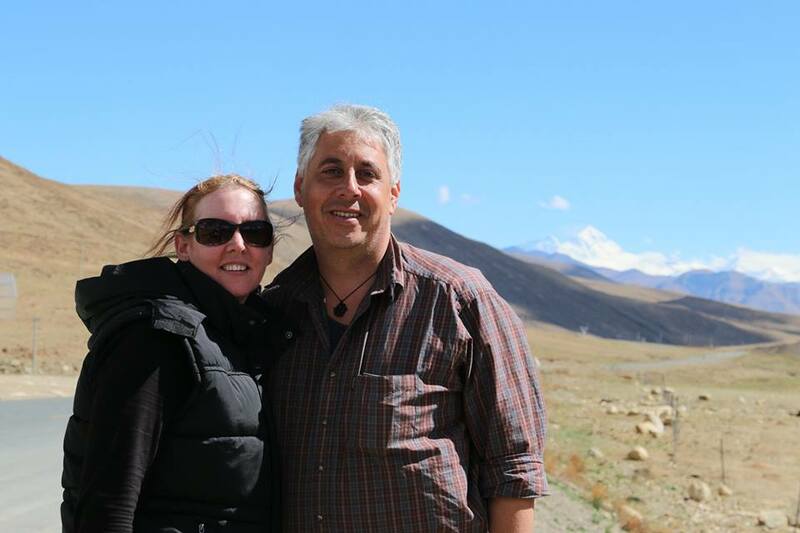 Along the way we reached the highest elevation that either of us had or will ever likely be at at 5248 meters which was at Gyatso La (Ocean Pass) which is actually about 50 metres higher than at base camp. Despite its popularity and the advanced transportation and communication networks Mount Everest is still a bugger to get to. 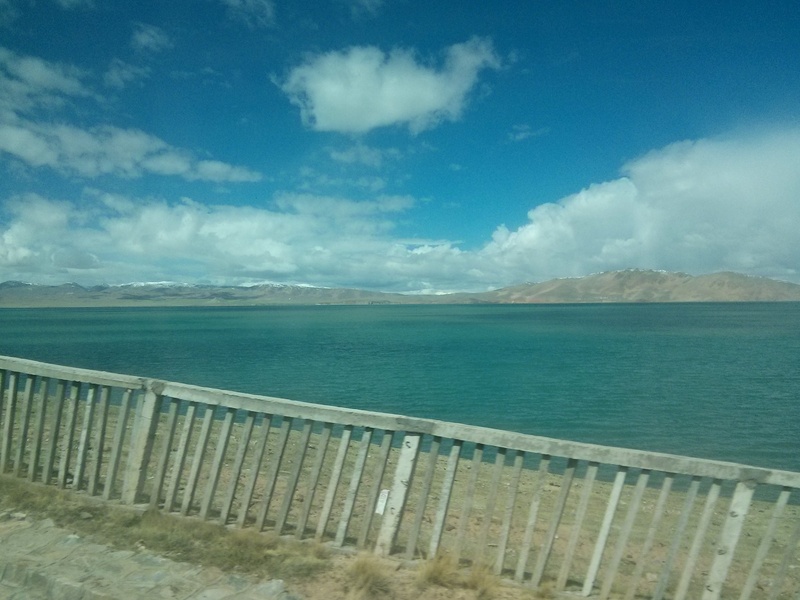 Our journey started with a 24 hr train ride from Xining (it would have been 44 hours if we had tried it from Beijing) to Lhasa. 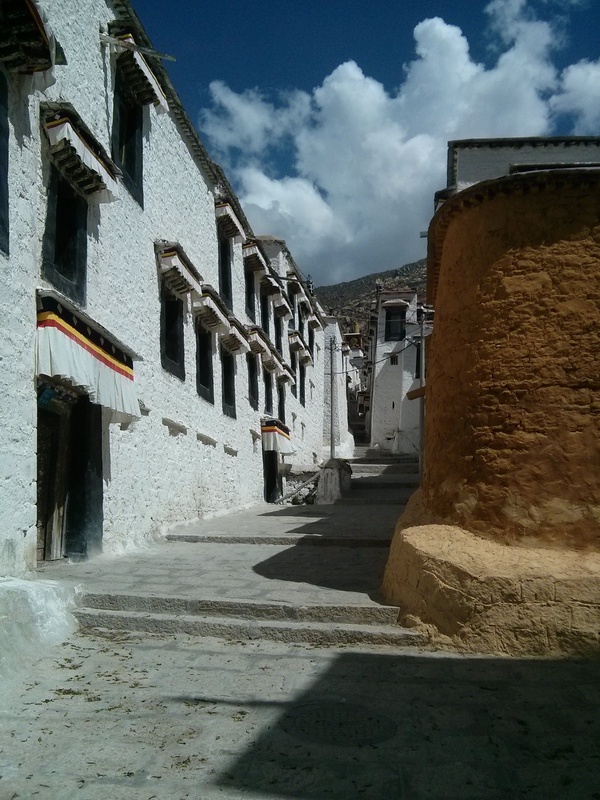 A couple of days to acclimatise to the altitude then a monster 13 hr drive to Shigatse. 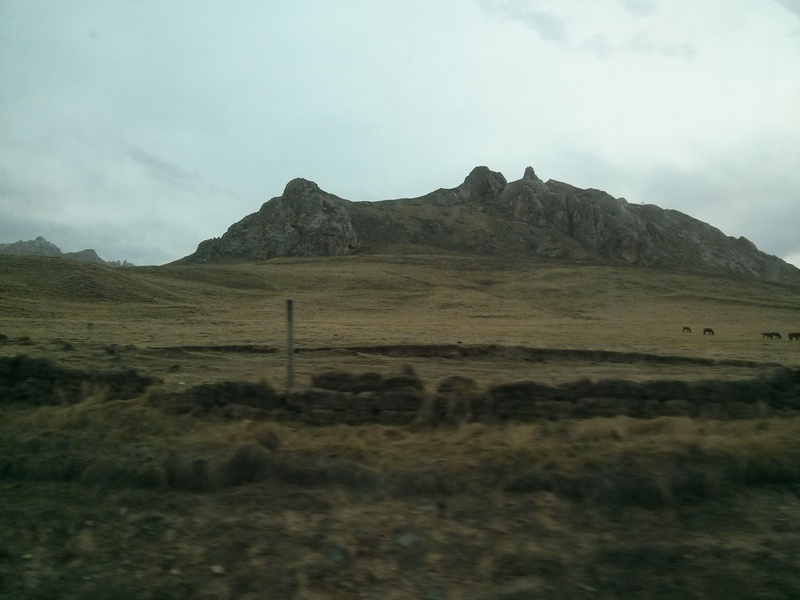 A quick nap and a feed and another 11 hr drive to base camp…the last 75kms on a bone jarring dirt track. Dawn photo session followed by breakfast and another trip up the mountain at 9 am with a 10:05am departure back for the 10.5 hr drive back to Shigatse. 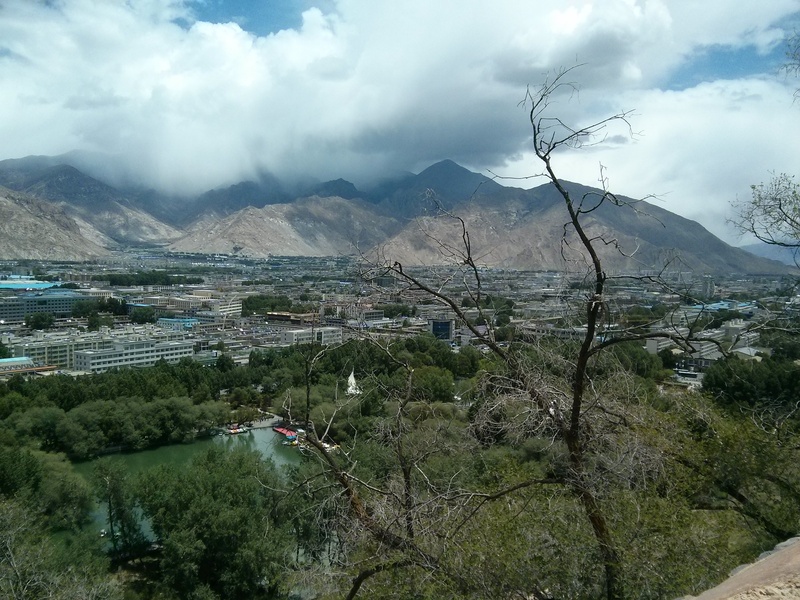 A shower, meal, nap and we were headed back on a 7hr drive to Lhasa for a night, before our 23 hr return train journey to Xining. 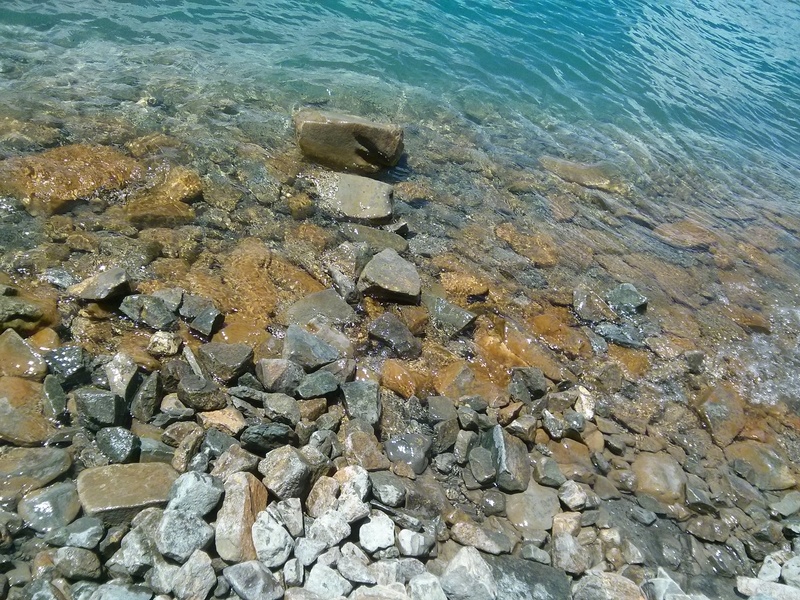 I guess if such a naturally beautiful place is to stay pristine then it will need to be out of the way. If you could get there by hopping a flight and taking a short cab ride it would cheapen the experience…we earned our views and photos. 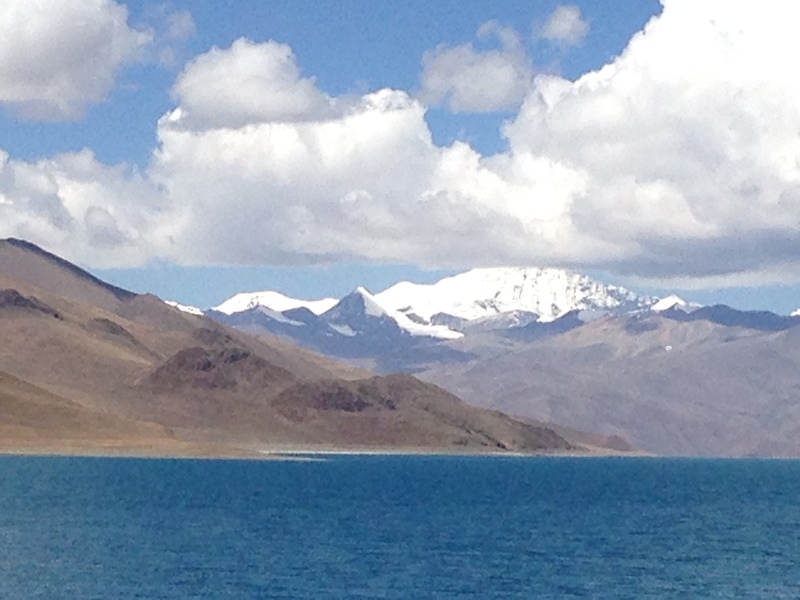 We were blessed with stunningly blue skies and clear weather throughout all of our time in Tibet. 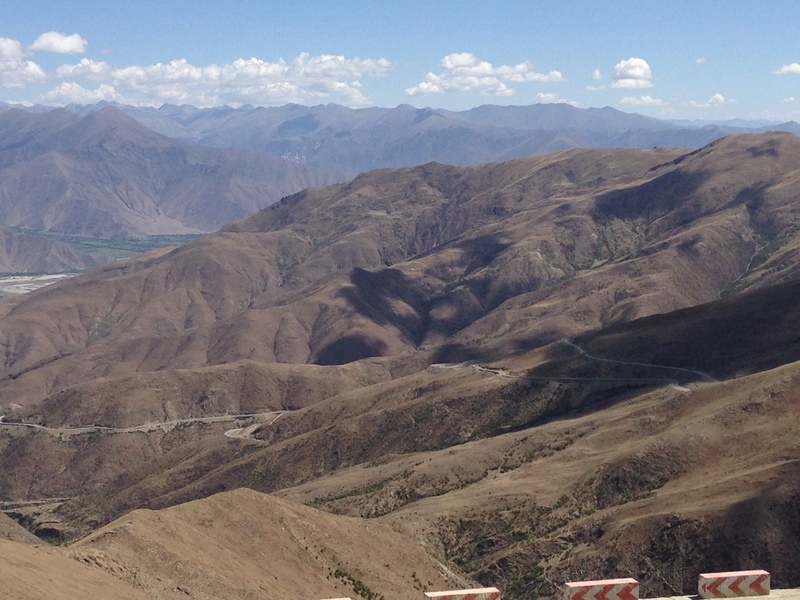 As you drive through endless tracts of desert and dry riverbed you begin to realise how desolate Tibet actually is. There are some stunning sights but they are a long way apart. 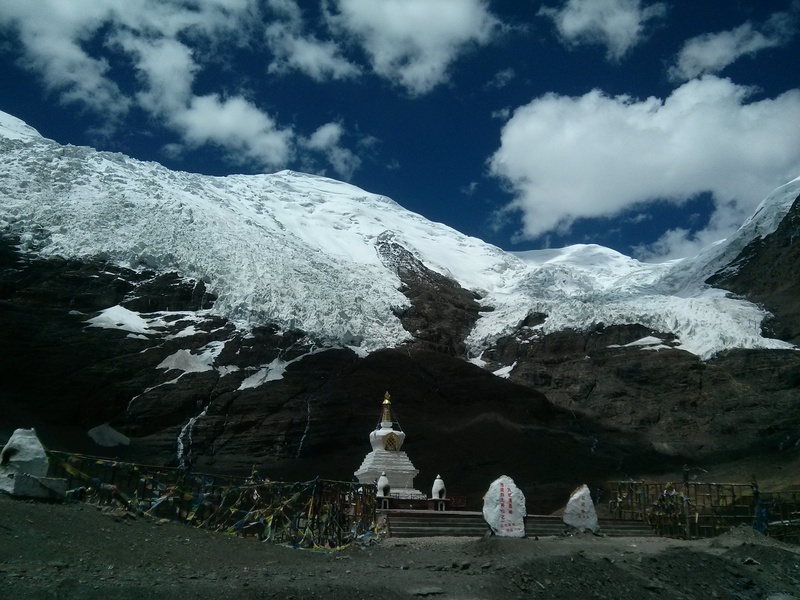 I had an image in my mind of what Tibet, Everest and base camp would be like and I was completely wrong on all three counts. The place is full of natural beauty but in a barren kind of way. 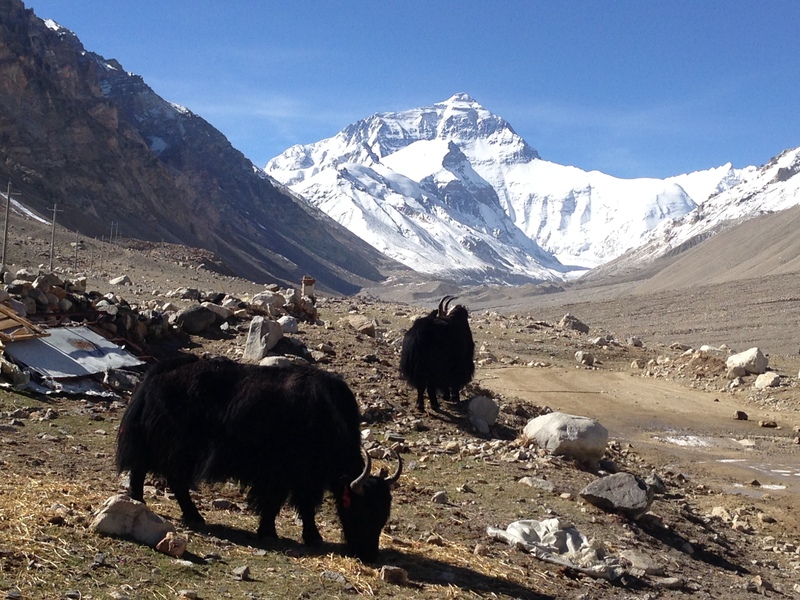 The soil is poor and the temperatures are cold so the vegetation is sparse and the landscape is dotted with hardy animals like yaks and goats. 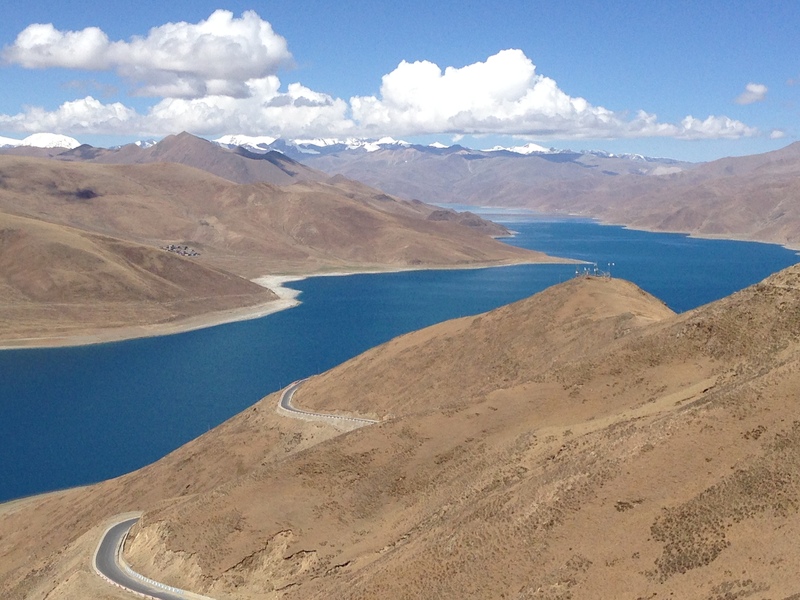 About 140 kilometres from the mountain along the torturous drive you catch your first real glimpse of Everest…and all the pain melts away. The great weather meant that our first viewing was the postcard shot. 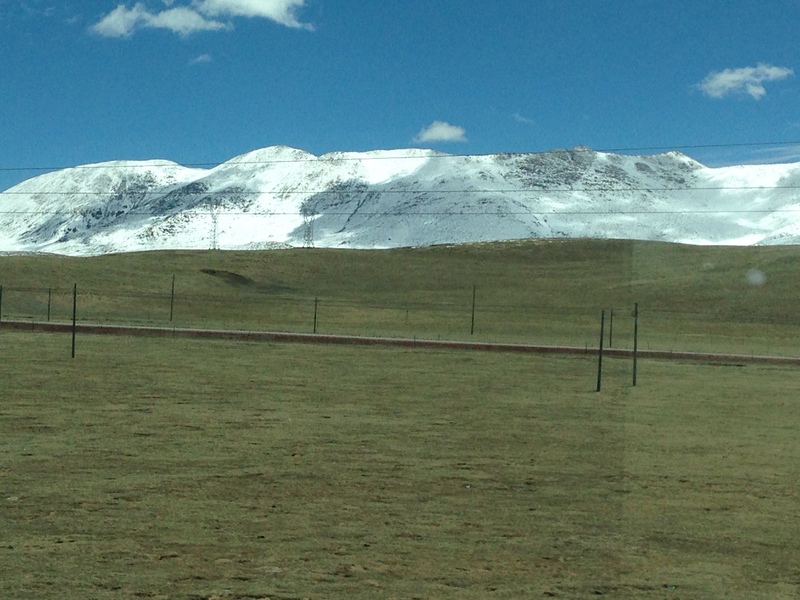 Our photo was of the peak with the wind blowing the snow wistfully from the top. A 10 minute stop for photos, oohs, aahs and wows…then back in the van for more torturous bumps. There are little if any facilities along the road and those that exist are feral. 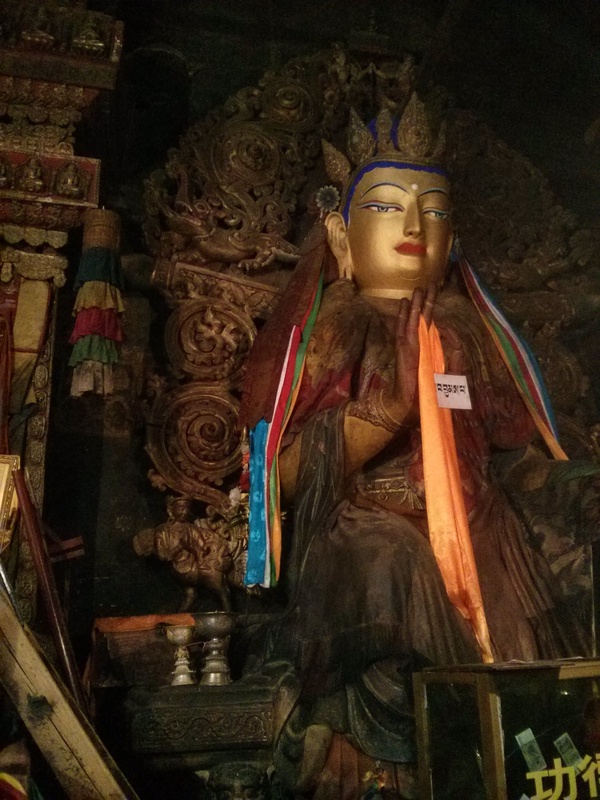 Nine people were jammed into a van for essentially 5 days solid driving with zero privacy…to see a mountain and the odd temple and monastery along the way. 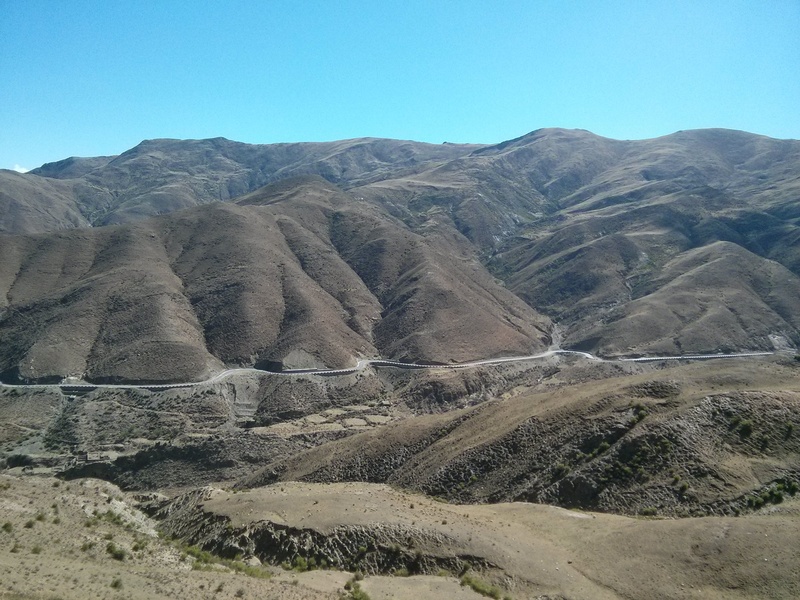 As you do the obscenely long and uncomfortable drive you are told to drink copious quantities of water to offset the effects of altitude sickness. We all did what we were told and still all got altitude sickness to one degree or the other. Bumpy roads, full bladders, no facilities…we got to know each other pretty well. 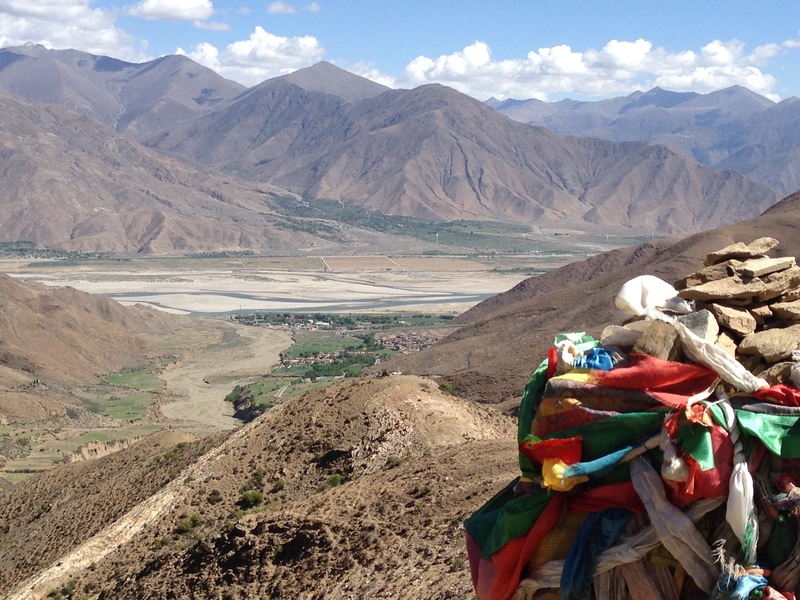 Altitude sickness is a phenomenon that affects everybody but in different ways and to different degrees. Some of the others in the group were put on drips, given oxygen and took anti-altitude medication. 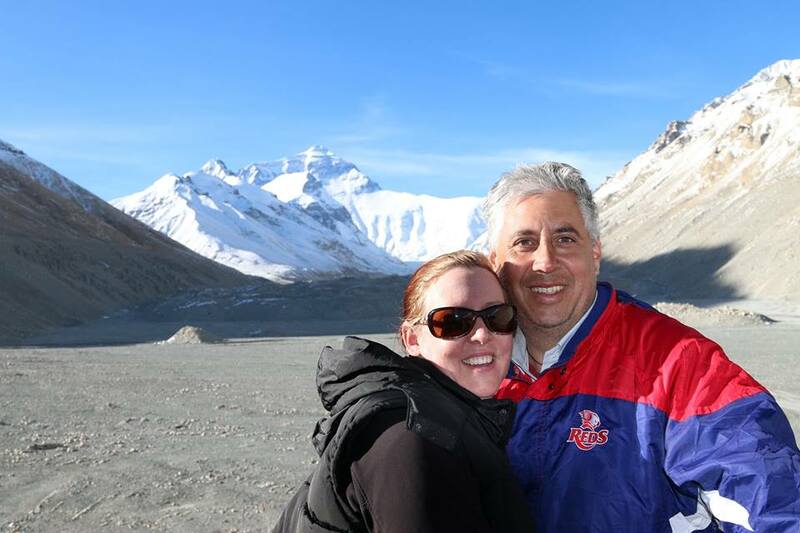 Jill and I had none of any of this…we did both get the headaches and shortness of breath, we both skipped the nausea and vomiting and I got the added joy of sleeplessness. 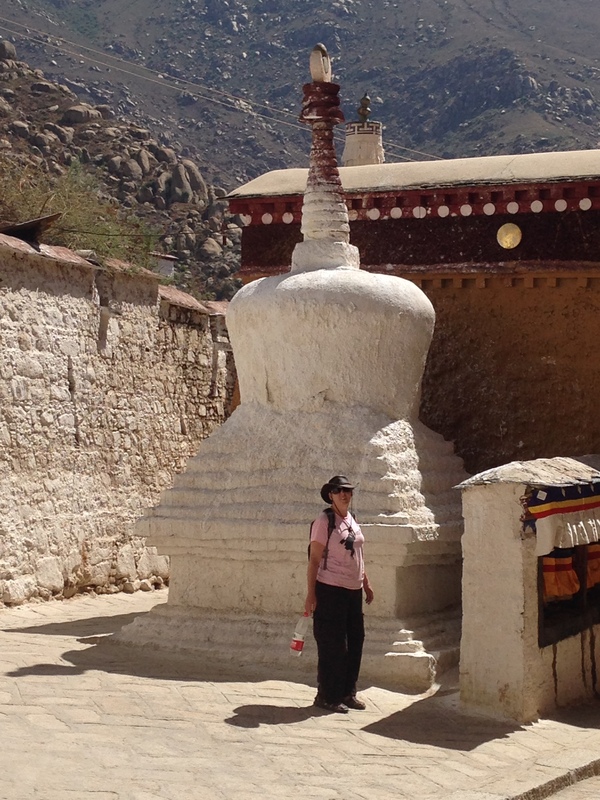 I basically had no sleep between leaving and returning to Lhasa (about 78 hours all up) then Jill forced another 9 hours on me as we had to go shopping and topping up our mobile phone credit. 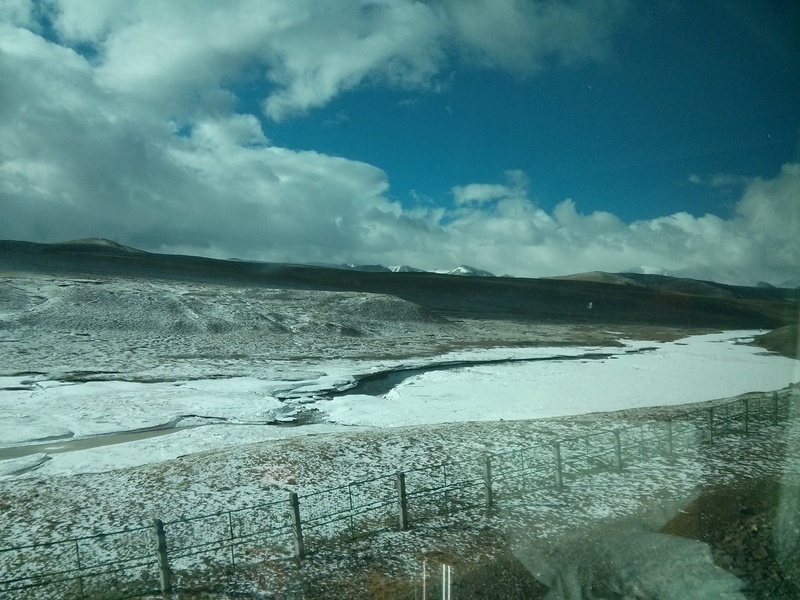 After 87 hours of being awake I caught about 4 hours sleep then headed for our 23 hr train ride back to Xining. 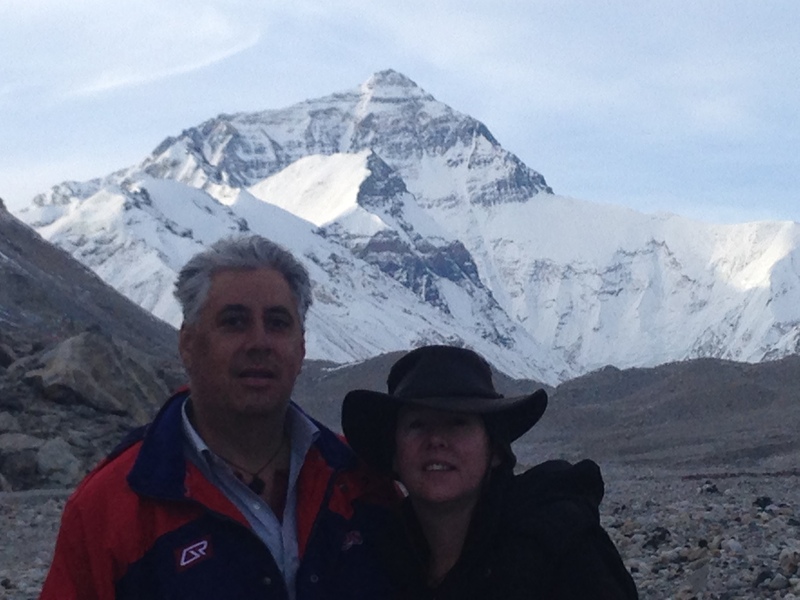 We finally arrived at Everest base camp at 10pm tired grumpy and exhausted. We did have a few choice photo opportunities along the way. But it was dark when we got in so we got into our accommodation, got fed and crashed. 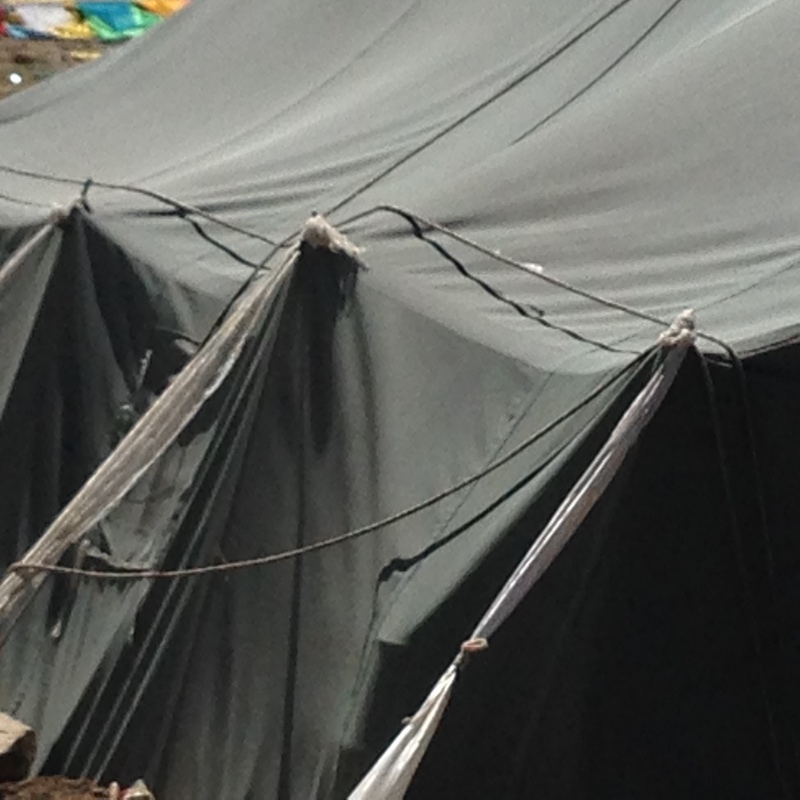 The accommodation was an indigenous tent on the side of the mountain. 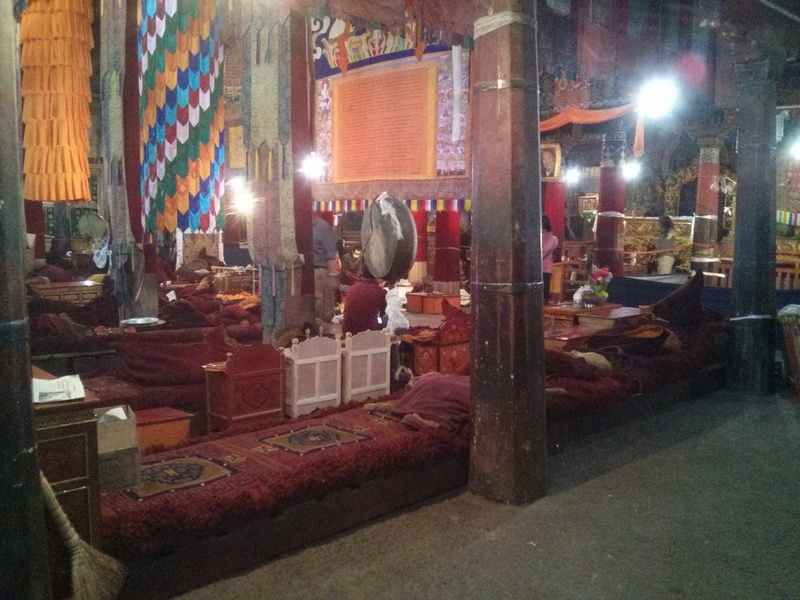 It had a wood stove in the centre, carpets on the dirt and a bench doubling as beds around the outside. The seven of us bunked down for a freezing night of communal camping while the driver and guide headed off to another tent. 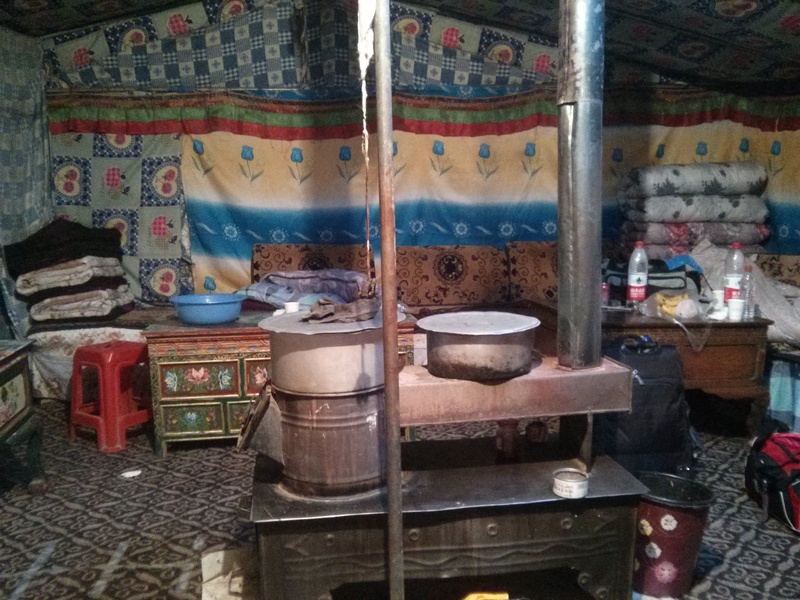 When I said it was a wood stove in the centre of the tent…this was accurate…but… It was not wood that was being burnt. 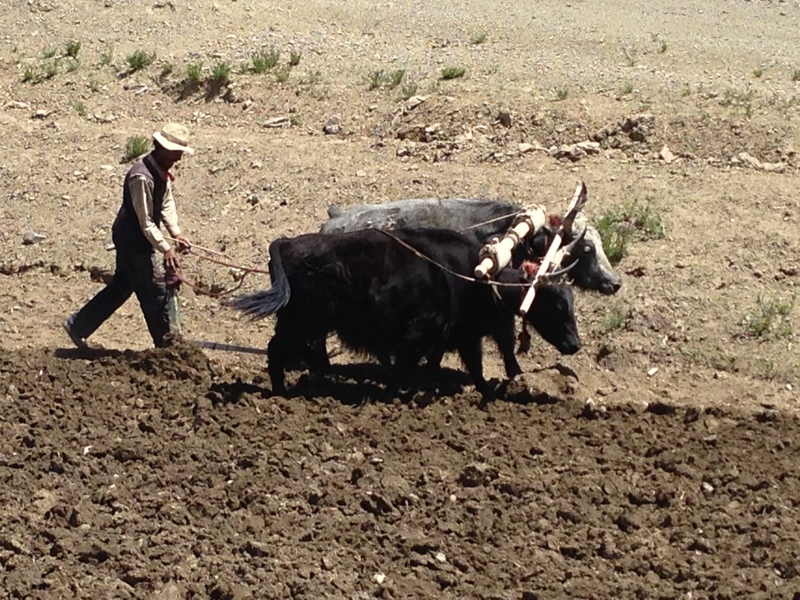 The fuel of choice in Tibet is Yak dung paddies and sheep and goat pellets. 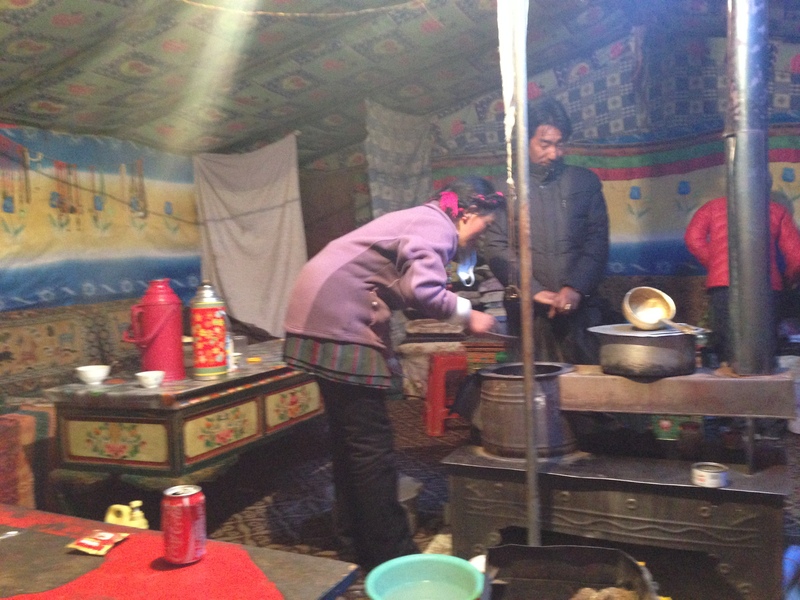 So in addition we had a rural aroma permeating the tent. The facilities were about 100 meters away and were totally rank and there was a very real threat that you could fall into a pit of raw sewage. Because of the threat of falling through the wooden floor in the tin shed onto the pit of raw sewage, those that had gone before had gone on the floorboards rather than braving the hole. So most of us chose torchlight and the rocky riverbed…behind whatever stone that might give you some semblance of cover. Clearly we were not the first with such an idea and the area was littered with human and animal excrement. So we added our fair share and moved on…I have a detailed version of this for my nephew Fleebs but have been banned from publishing it. After a fitful nights sleep for most and no sleep for me…the sun rose and most of us headed to the other end of base camp for sunrise shots of Everest. Standing at over 5200 meters watching the early morning sun reflect off the highest point on the planet seemed to make all the pain of the preceding few days melt away. Back for brekkie then hop a bus to take you another 6-8 Kms closer for an hour of photos and our odyssey was over…except for the return journey. 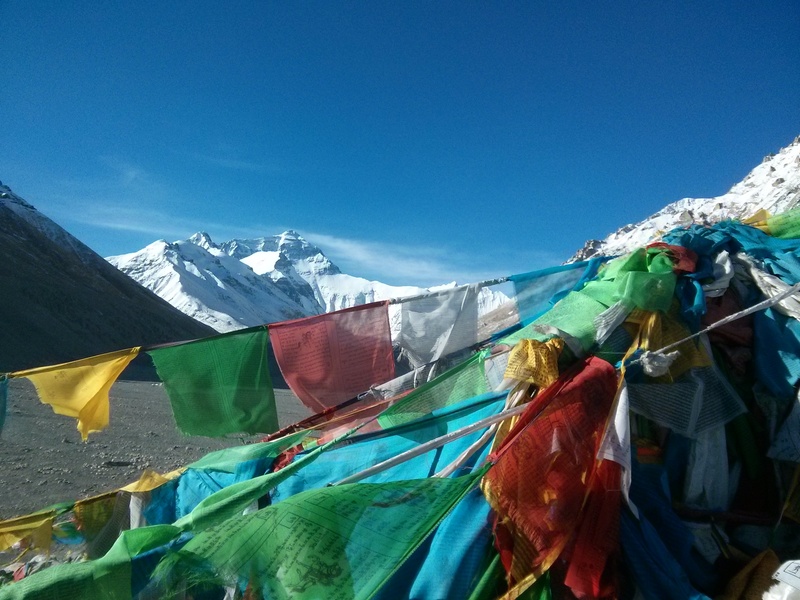 Mount Everest is definitely a bucket list item but one that needs to be seriously considered before embarking. This is a destination that cannot be taken lightly and is a serious investment in time and damage on your body. 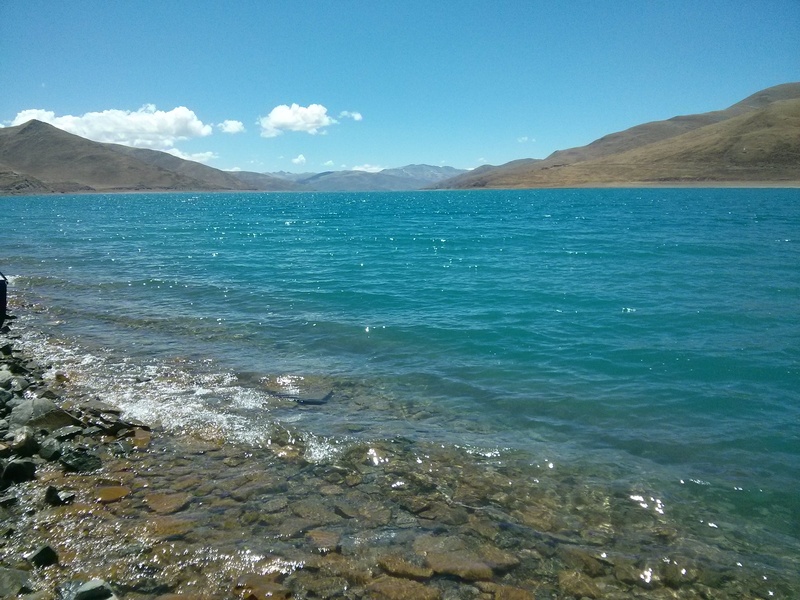 Our trip was in the Tibetan summer and the weather was perfect…and the trip was still tough. The guide told us stories of others that had had weeks on the mountain and barely got to see it due to the clouds and mist…we were VERY lucky. While it is a fantastic thing to have done and no doubt in the future we will regale you with stories of the time we slept in a tent at the northern face base camp (EBC for those of us who have been there) of Mount Everest in Tibet… we are both glad it is over and we are headed back to Xining for some well earned rest and a little bit of pampering. We can get one hour massages for less than $8 and both of us are aching and in need of some down time.